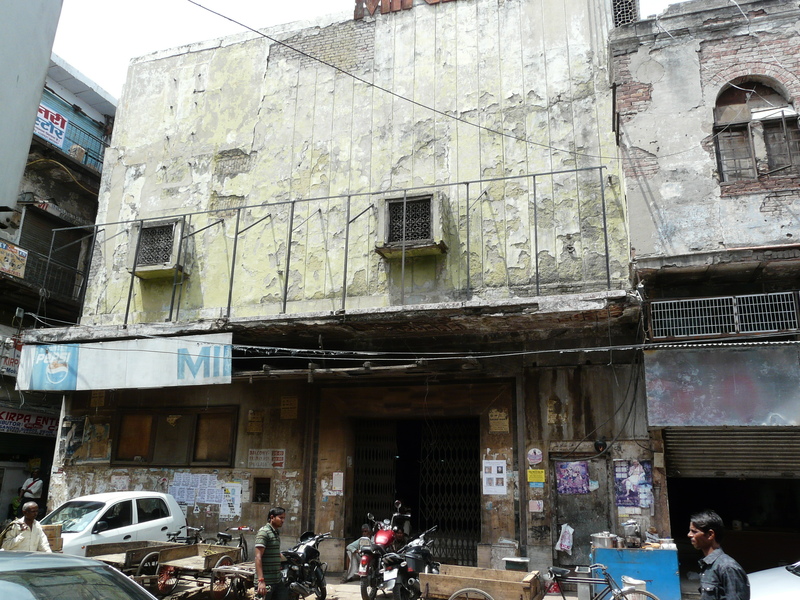 While exploring Old Delhi and adjoining areas like Sadar Bazaar and Pahar Ganj, I’ve come across some deliciously intriguing decades-old cinema halls. 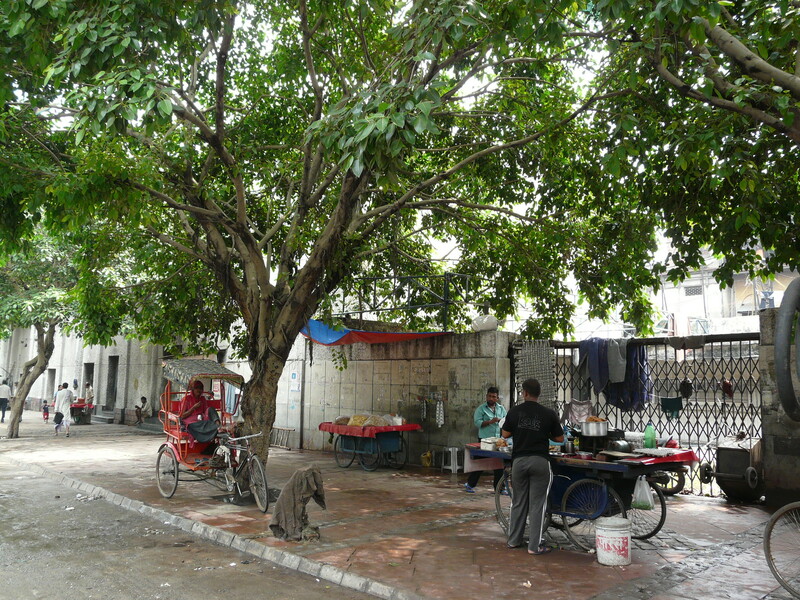 Some are doing fine, some just getting along, while some seem to have shut shop or might be under litigation. 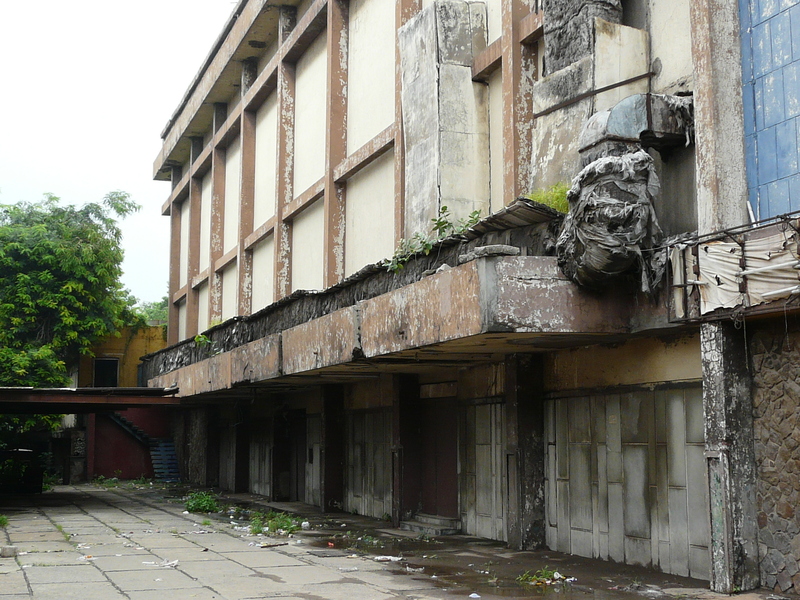 This post is a visual exploration of those theaters – I haven’t gone into their histories, though I’m sure each and every one would reveal interesting stories with a little digging into. 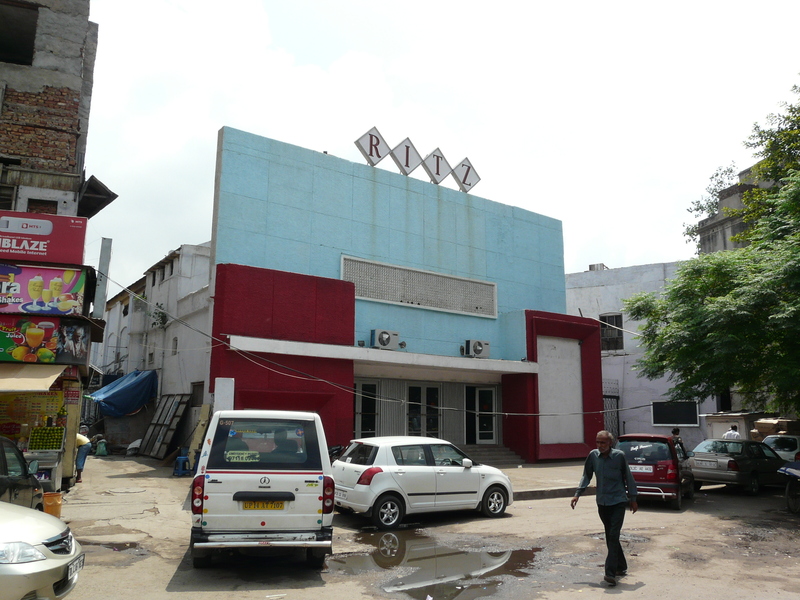 I’m assuming that these cinema halls all came up between the 1950s and 80s, though dates would have to be confirmed. 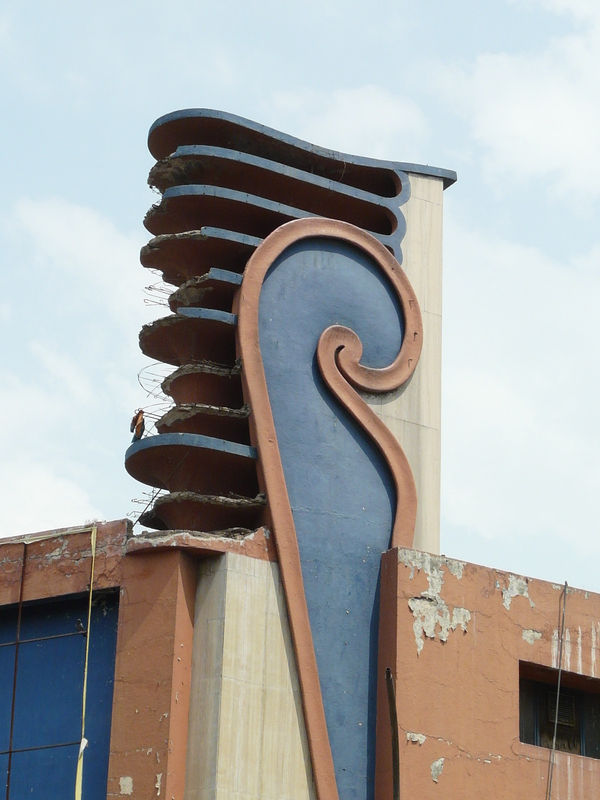 This finial flourish atop Filmistan cinema hall became my mascot for the project! 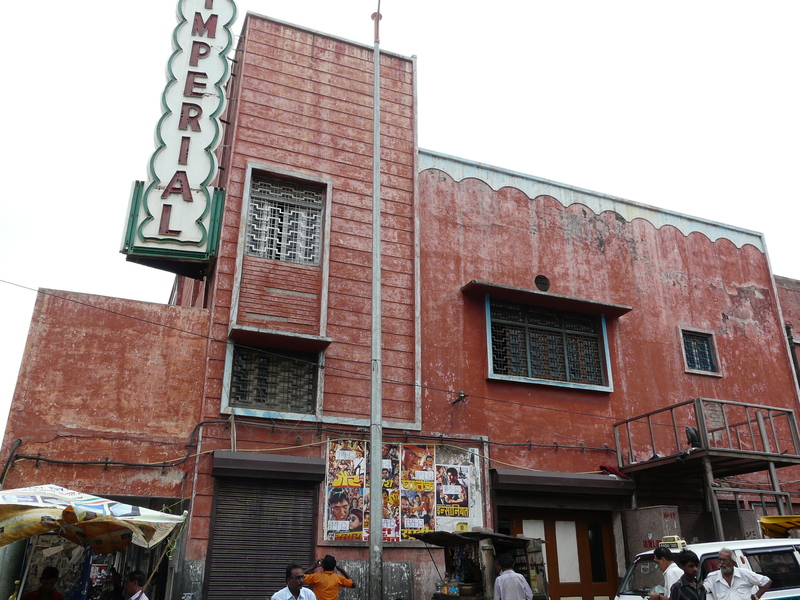 While an exploration into the history of these theaters would in all probability be very rewarding, there are a couple of things that begin to become clear with just a visual exploration. 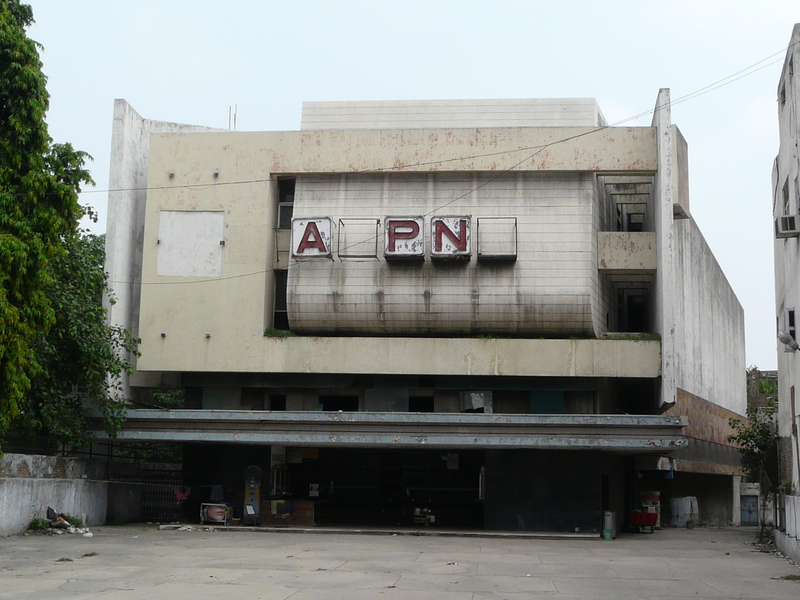 The first is in many ways obvious – how the state of these theaters is often indicative of the fates and recent histories of the areas they are situated in. 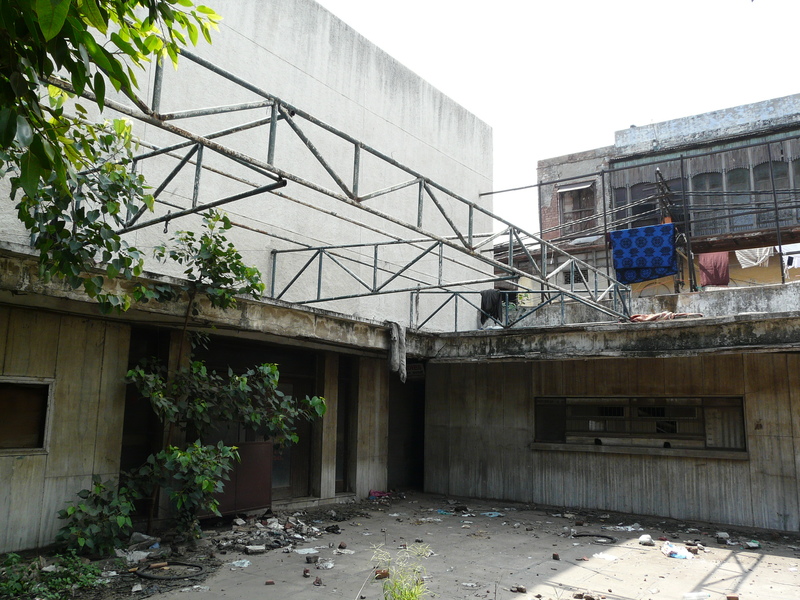 The second is how they help to plot out the development of cinema hall design in Delhi from the 1950s to the present. I’ll come back to these two aspects later on in the post. 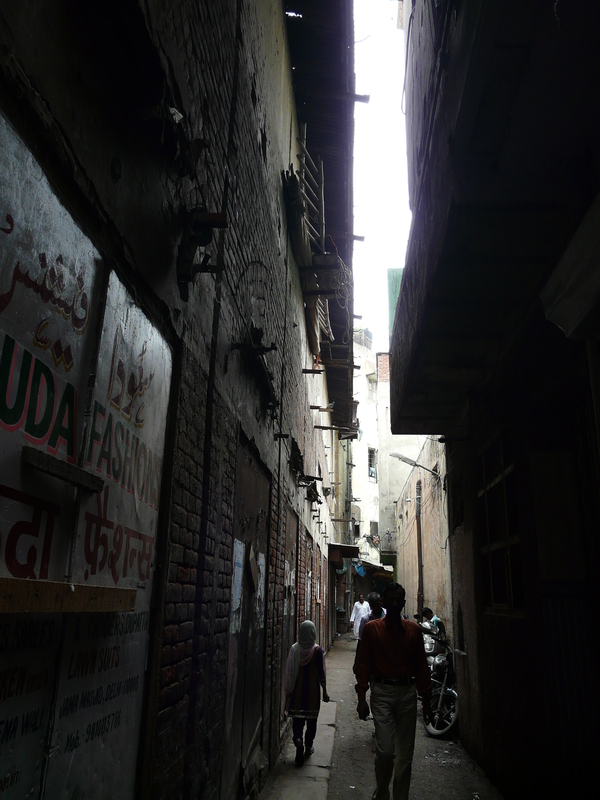 The sequence starts with Old Delhi itself, before moving on to Sadar Bazaar, Pahar Ganj and Sabzi Mandi, and then a little further afield as well. 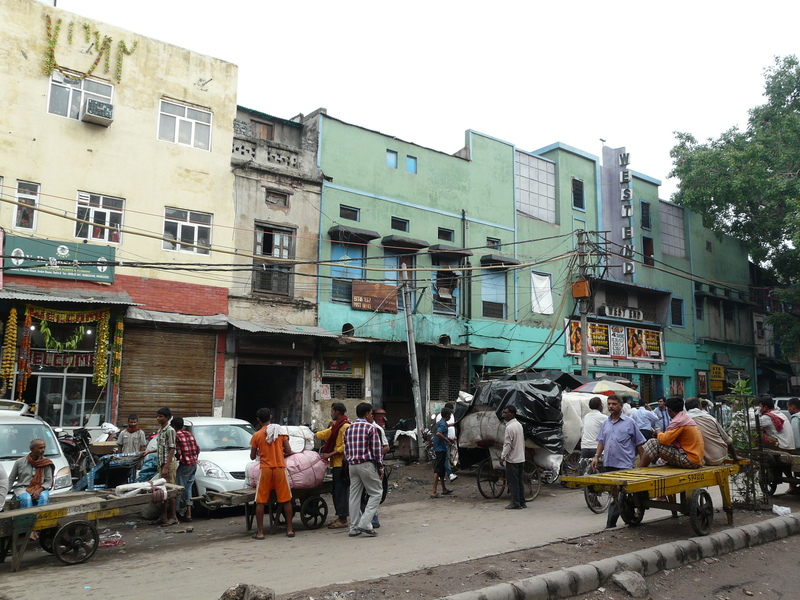 Within Old Delhi, I’m moving roughly north-to-south, starting with the Kashmiri Gate area and ending at Daryaganj and Asaf Ali Road. 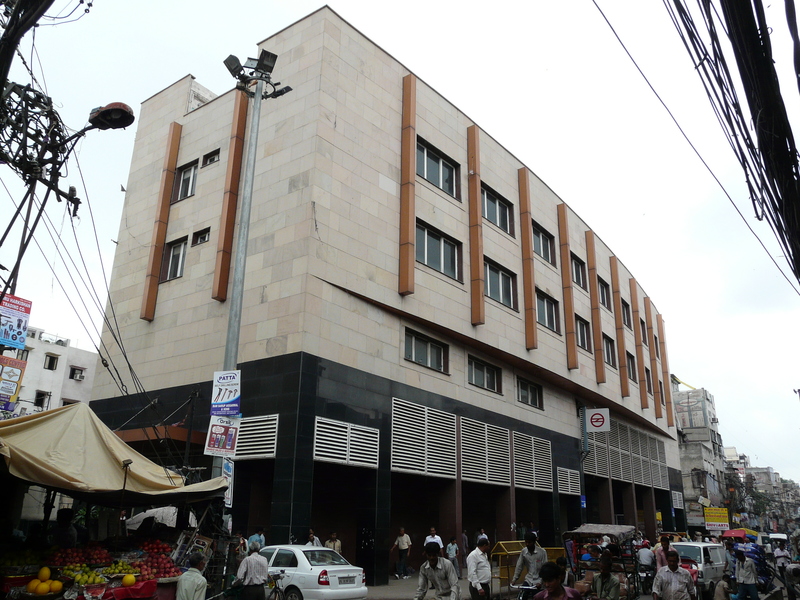 Ritz is located just south of Kashmiri Gate on Lothian Road. 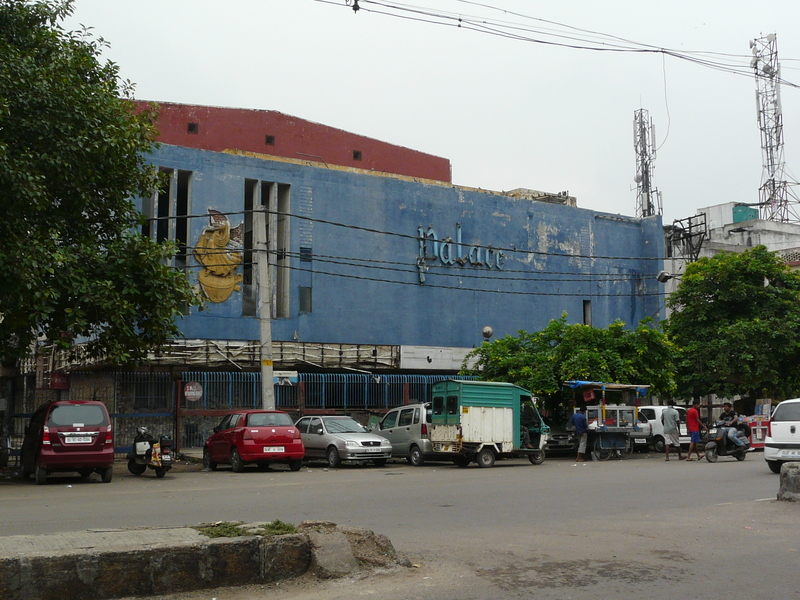 Since the the area south of Kashmiri Gate used to be a thriving and upmarket commercial area in decades past, I’m assuming Ritz would have been a thriving theater in its time. 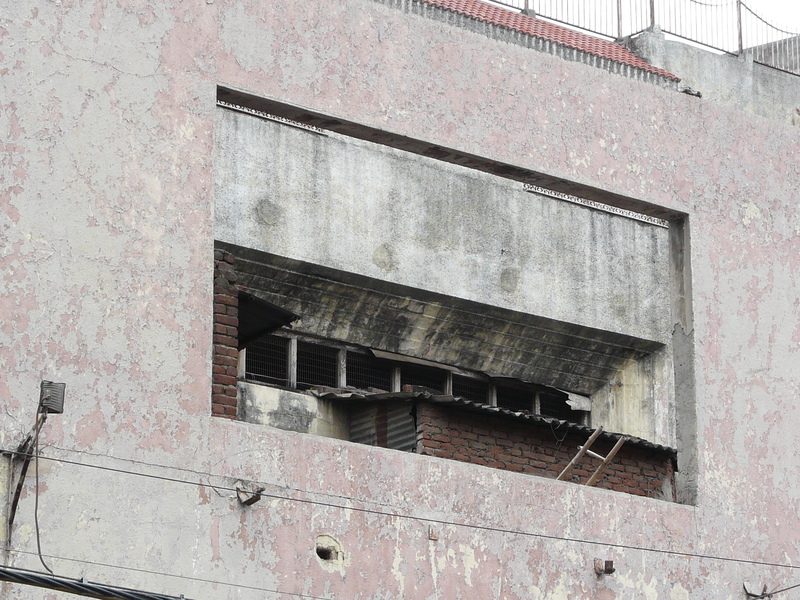 We can see that the facade of the building is newer than the rest of the structure, so it might have looked different in its heyday. 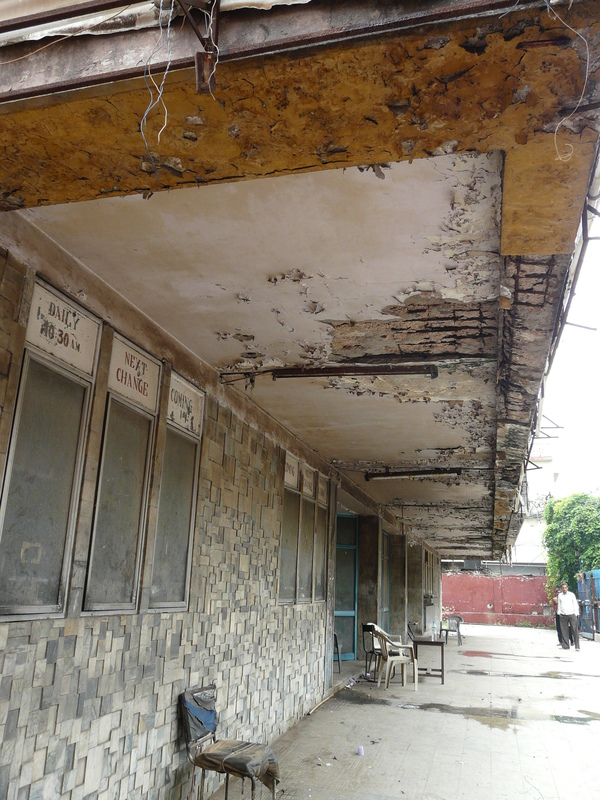 There were no movie posters being displayed, but the building wasn’t dilapidated either. Minerva lies along a side-street off Lothian Road, a little south of Ritz. 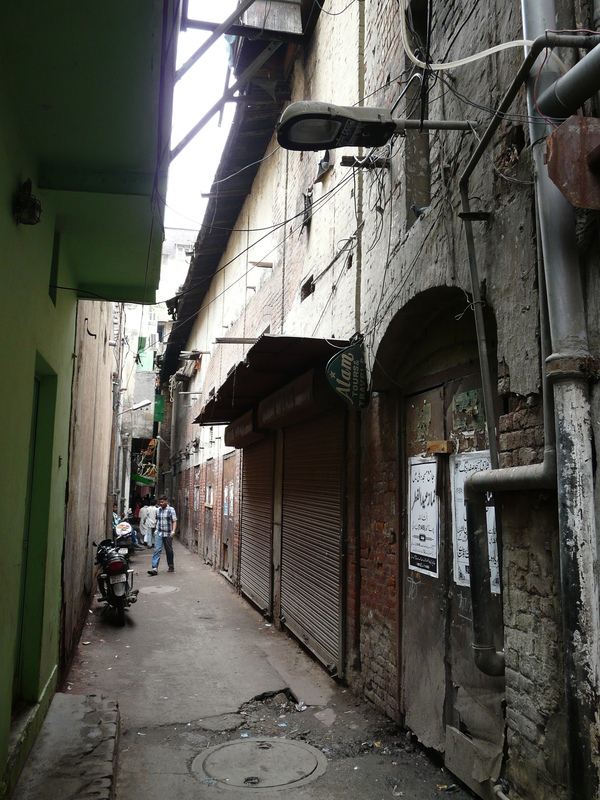 It is also located in the same once-upmarket commercial area south of Kashmiri Gate, but has shut operations many years ago. It seems to be occupied by right now. 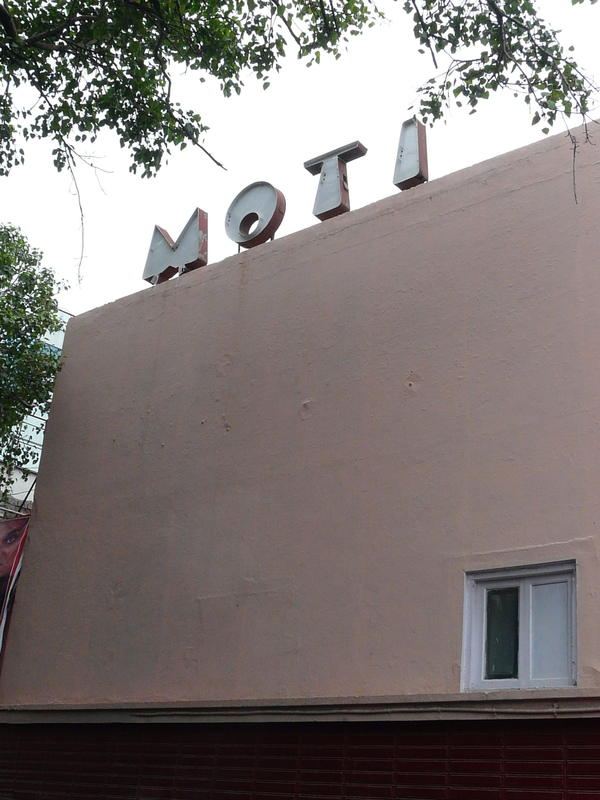 Moti is the first cinema hall one comes across along Chandni Chowk from the Red Fort side. 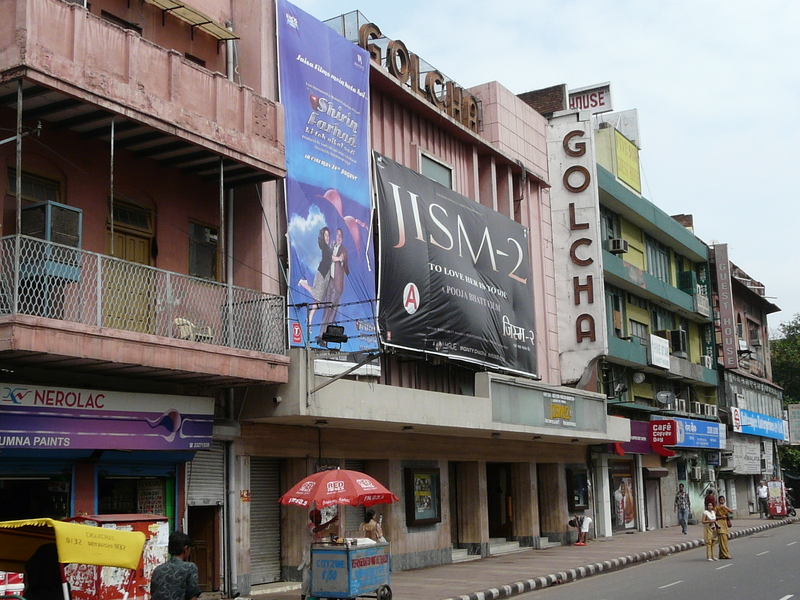 Or more accurately, it is the first cinema hall one misses, because the entrance from Chandni Chowk is indicated only by a not-very-large poster advertising the current movie (which in this case is a “B movie” from the 1980s). 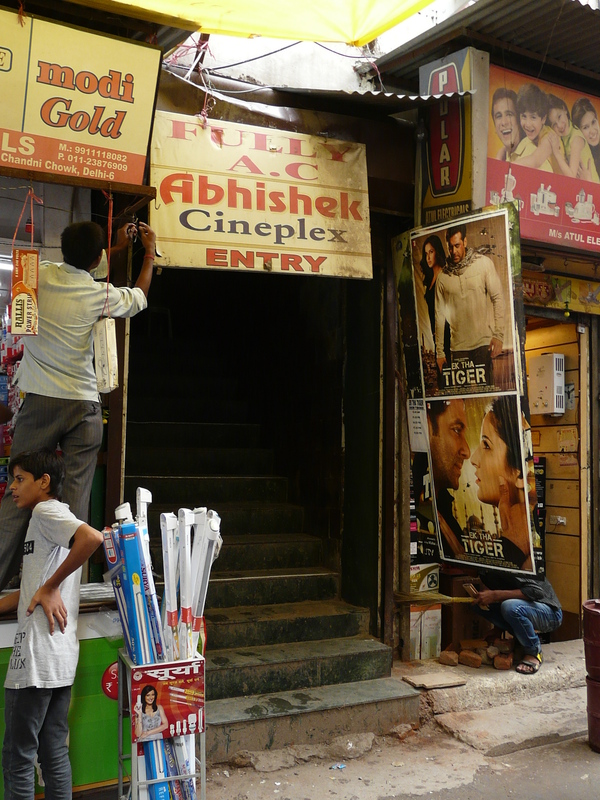 There is a small passageway under the poster leading to the theater. 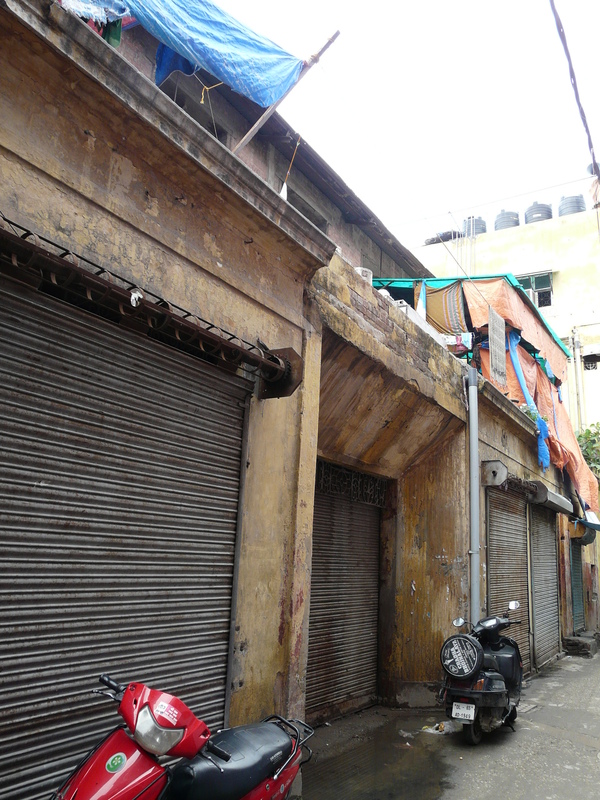 The main entrance is from a side-street off Chandni Chowk. 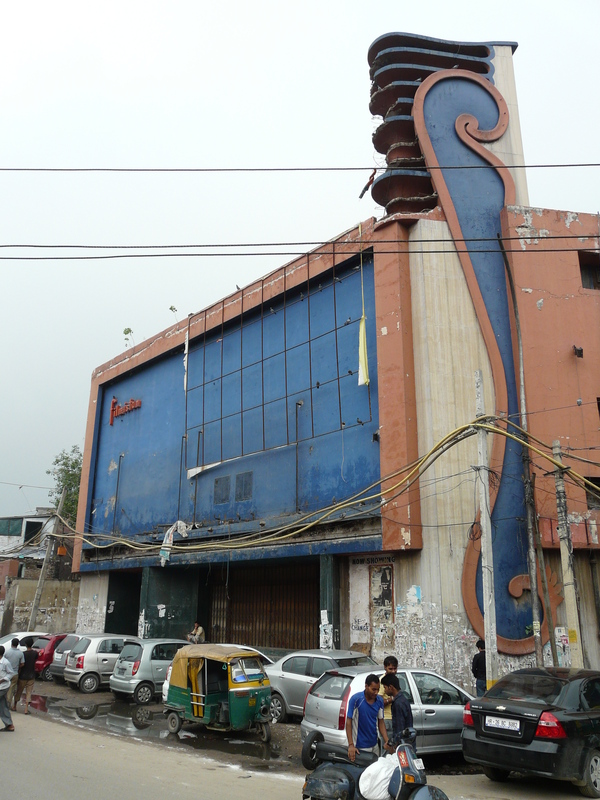 Kumar is a small theater (now apparently going by the name Abhishek Cineplex) on Chandni Chowk. 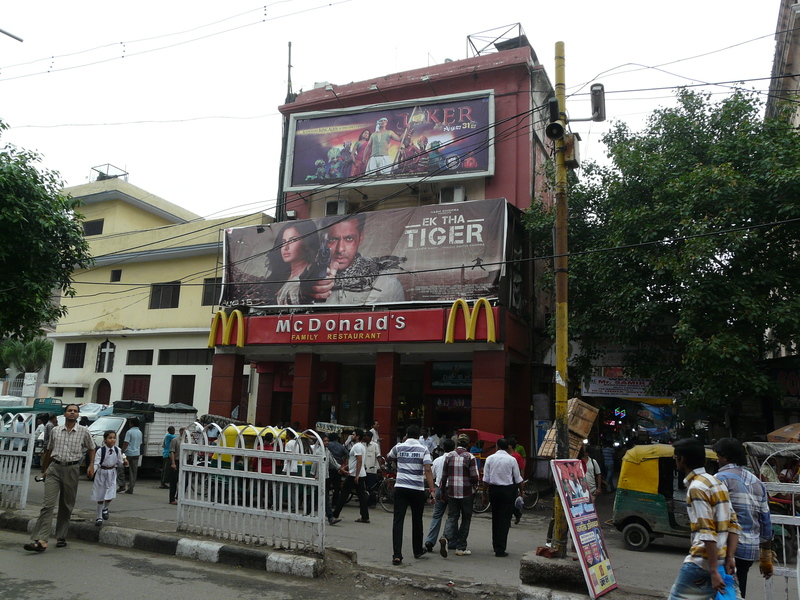 Now that its foyer is occupied by a McDonald’s, there is a seedy entrance from the side, though the theater is showing the latest Bollywood movies. 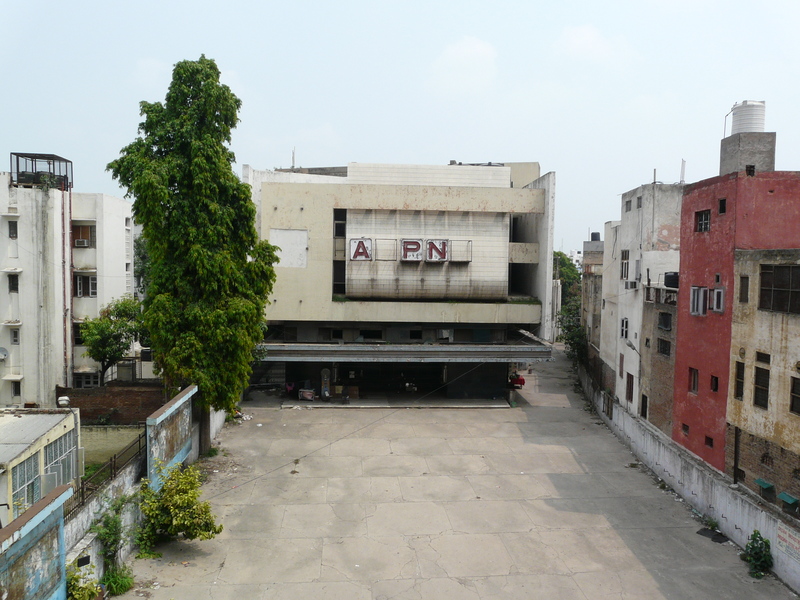 Not on Chandni Chowk but instead on SP Mukherji Marg, beyond the bustling Old Delhi Railway Station, Novelty is a nondescript and shuttered cinema hall that seems to have been built in the 1980s. 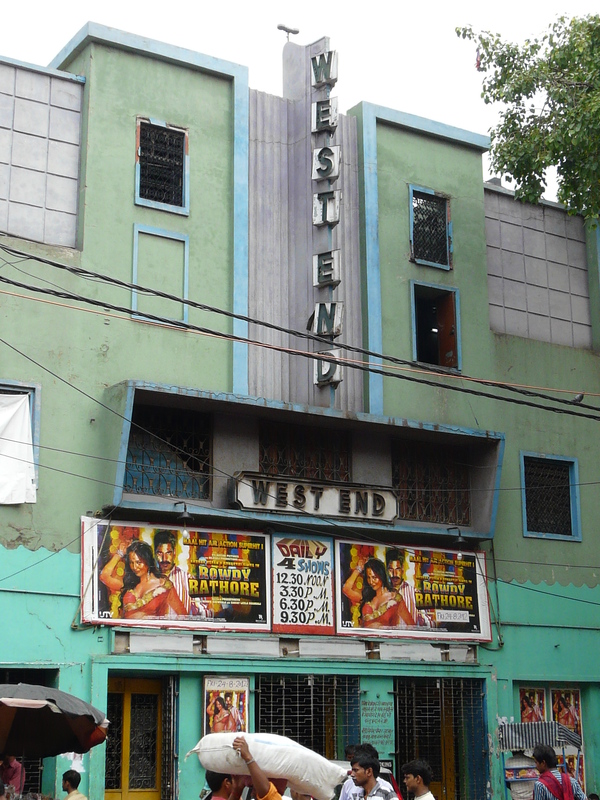 Moving away from Chandni Chowk, Excelsior is near busy Hauz Qazi Chowk, on Lal Kuan road, also showing old B movies. 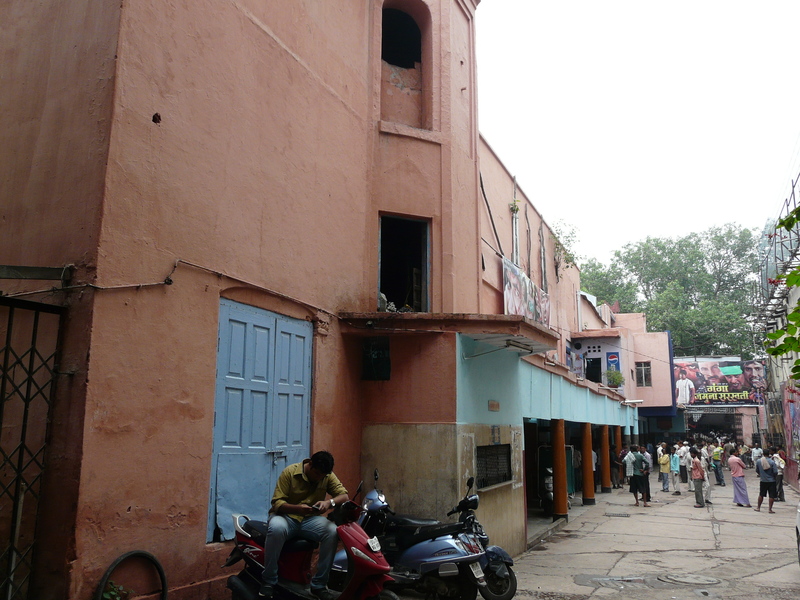 This theater is near Old Delhi’s famous Jami Masjid. 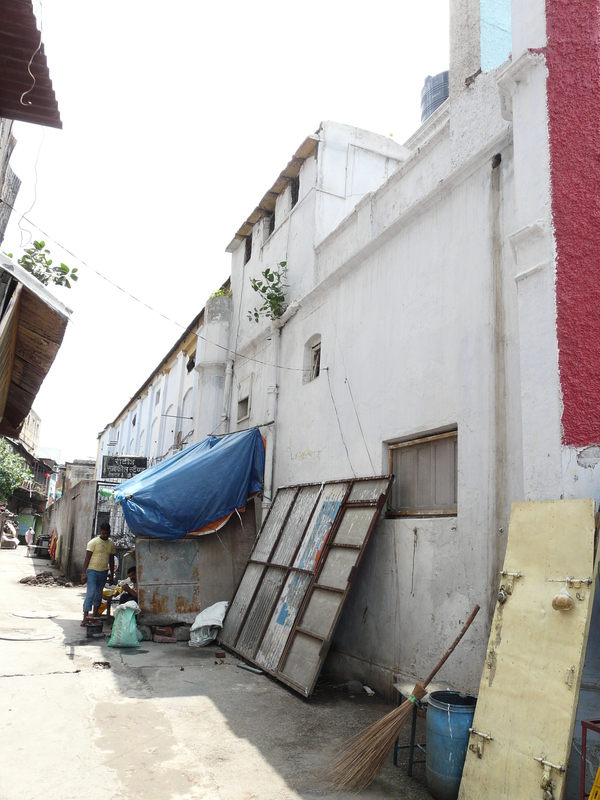 It has a very plain facade which might have been built in front of an older one. This theater is also shut down. 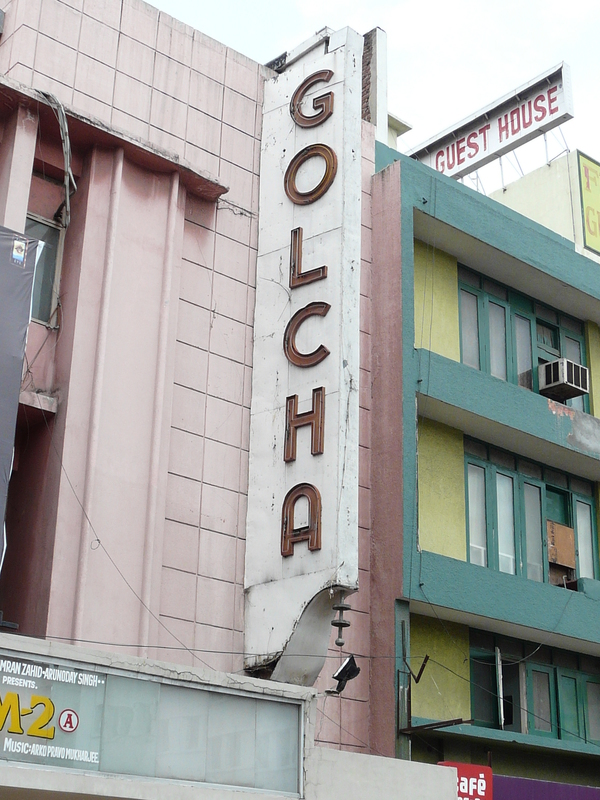 Anyone familiar with the Daryaganj area will be familiar with Golcha cinema, which seems to still be going strong. 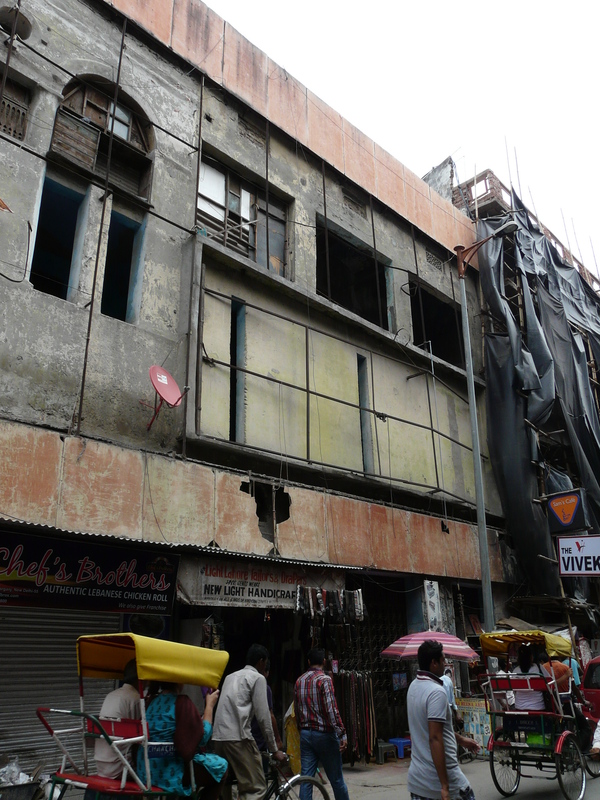 “Delite” on Asaf Ali Marg, on the edge of Old Delhi, is part of a larger building that also contains offices. 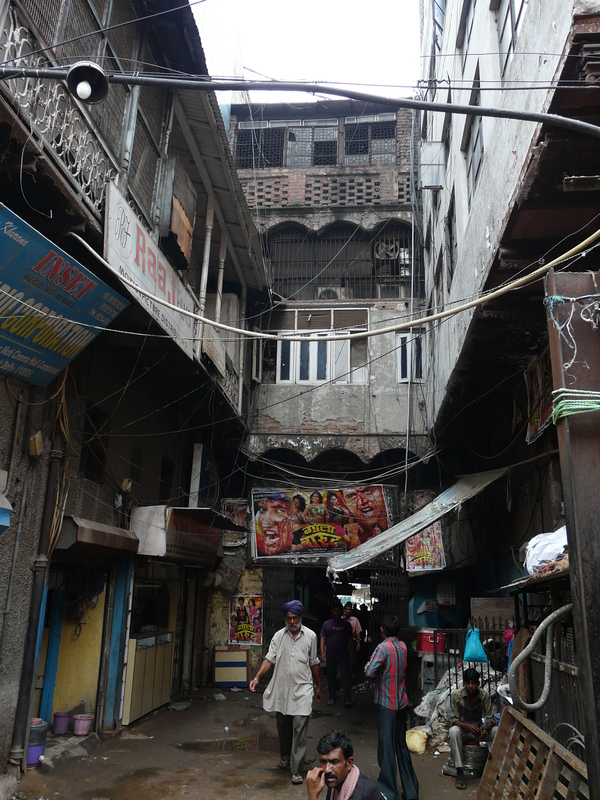 These areas surround Old Delhi to the west and north west, and form the “older” part of modern Delhi. 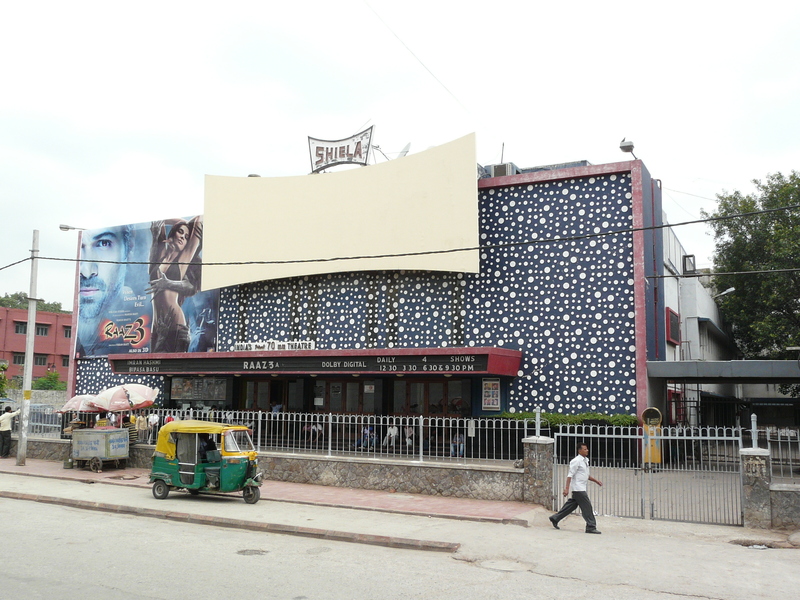 They contain some of the most interesting cinema halls covered in this post. 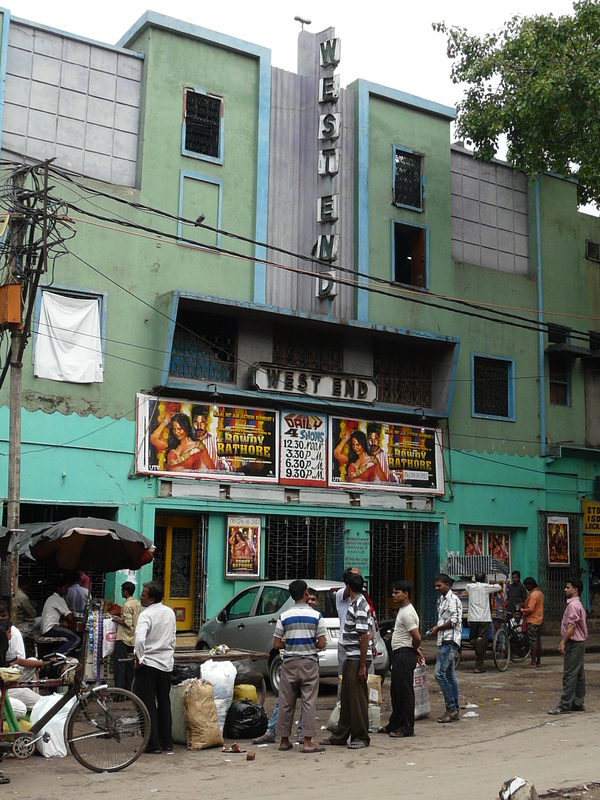 Filmistan with its flamboyant facade is on Rani Jhansi Road in the Sadar Bazaar area. 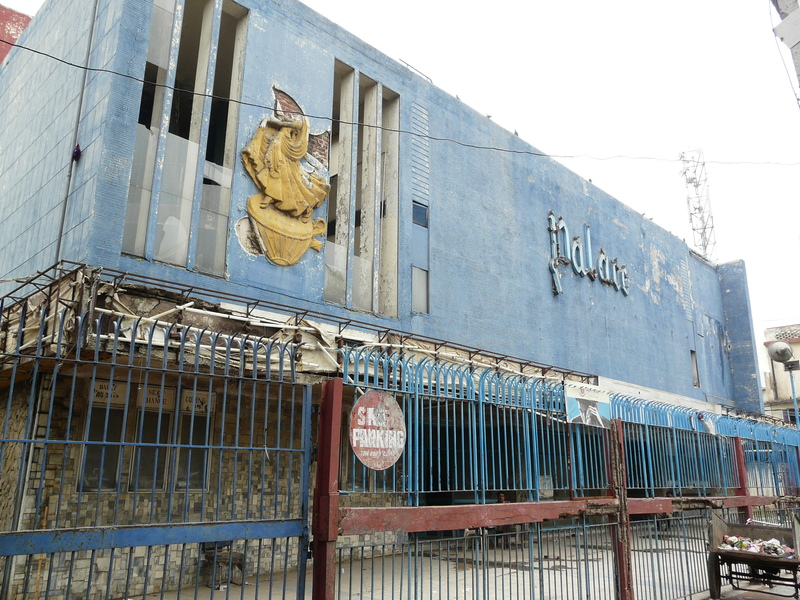 Now shut down, it must have been a busy theater in its prime! 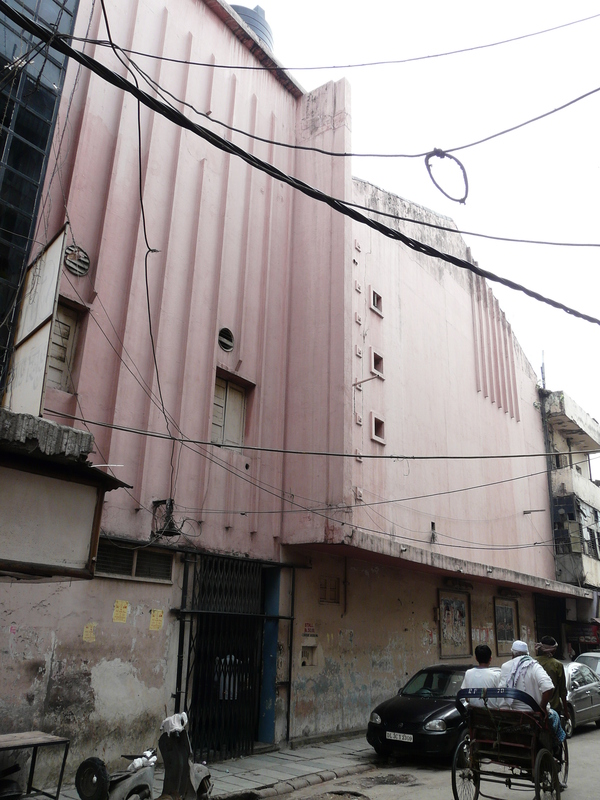 This theater along Durgamal Surana Marg in Sadar Bazaar still has “Daily 4 shows”. 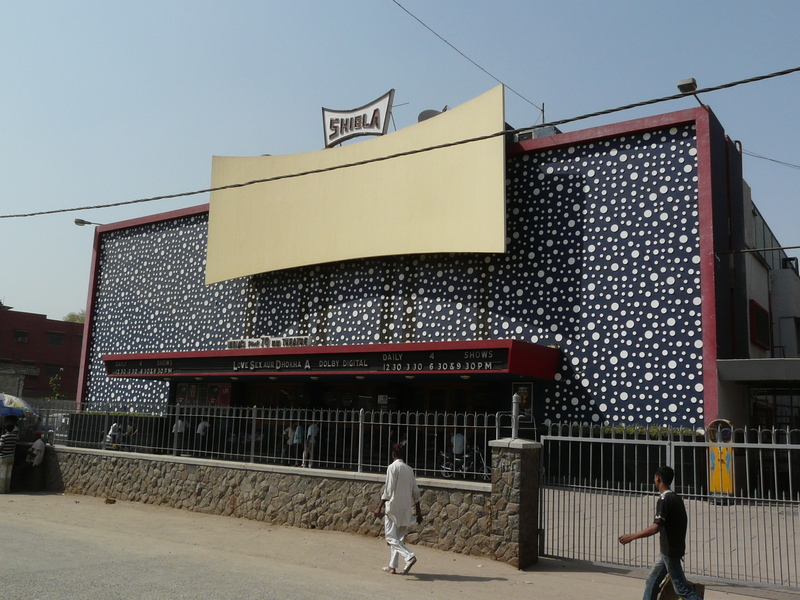 “Shiela” with its psychedelic facade is in the Pahar Ganj area on DB Gupta Road. 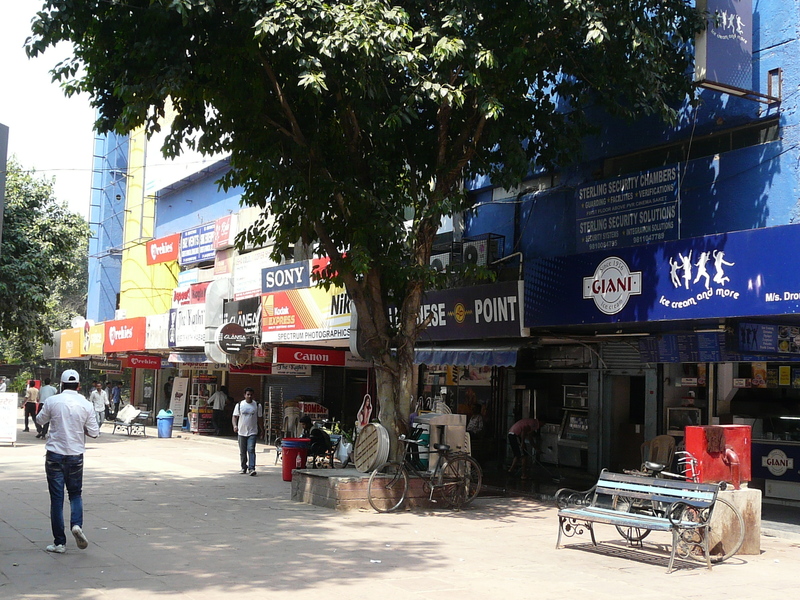 Close to the New Delhi Railway Station, it shows the latest releases. 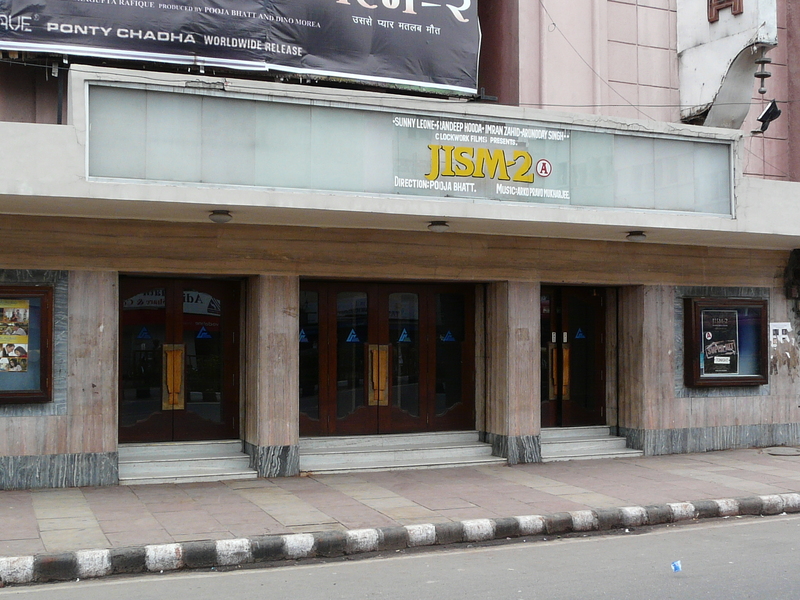 Apparently, “India’s first 70mm theater”! 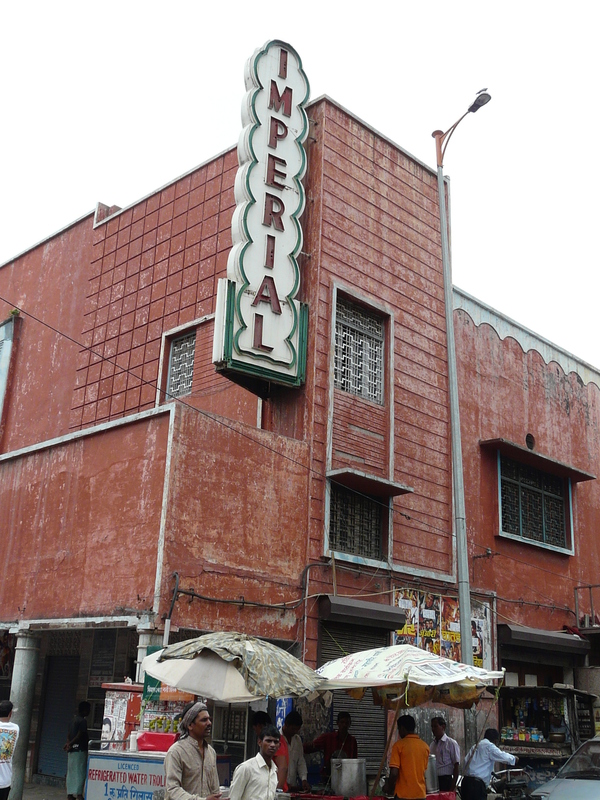 Imperial is another amazing cinema building in Pahar Ganj that probably dates back to the 1950s or 60s, but it is now relegated to showing old B movies and “special” matinee shows. Very close to Imperial is (was) Khanna, which seems to have shut down completely. 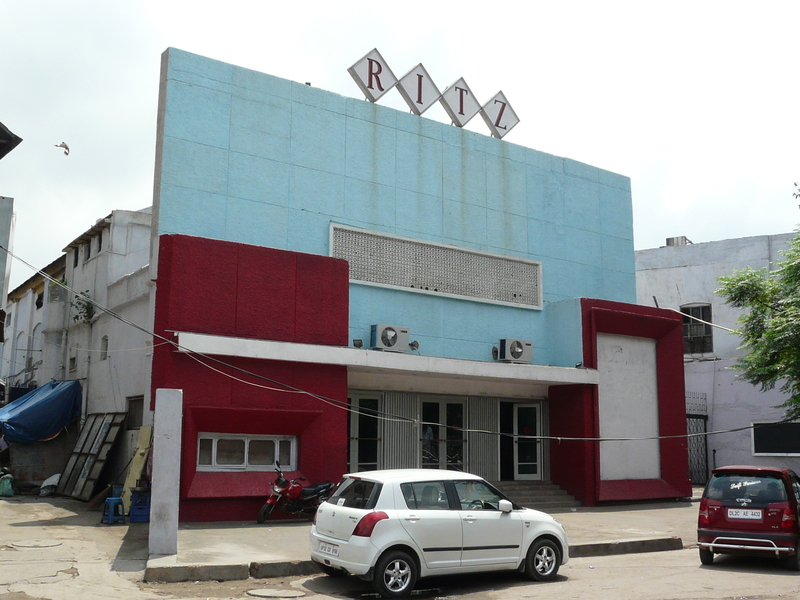 There is little indication that a cinema hall existed in this building at all, save for the remnants of the long narrow banner running above the entrance to the building, and the rectangular space for movie posters. 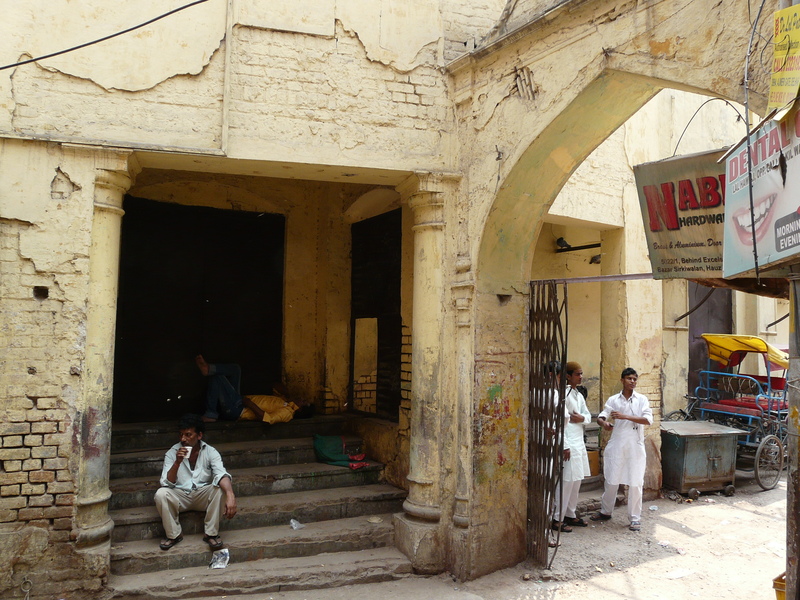 Palace was a large theater in the old Sabzi Mandi area, but is now closed down. 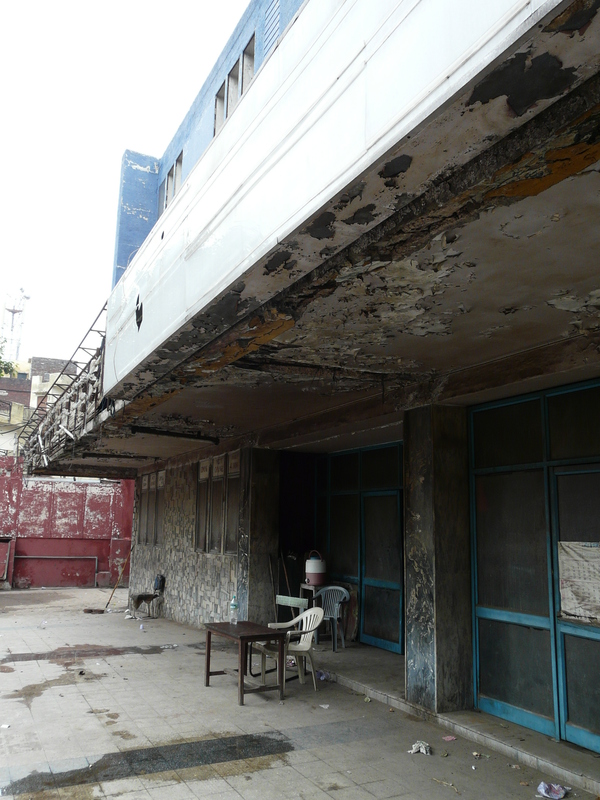 I was able to get into the premises and photograph the dilapidated state of this theater, which is reminiscent of abandoned factory wasteland scenes. 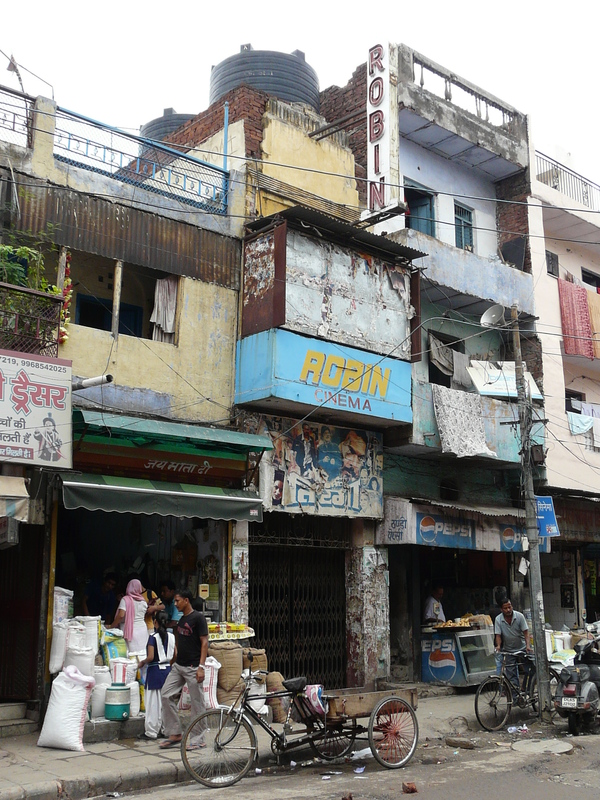 The now defunct Robin is located in the Sabzi Mandi area on the main GT Road near the clock tower, where the road narrows to barely more than single-lane. 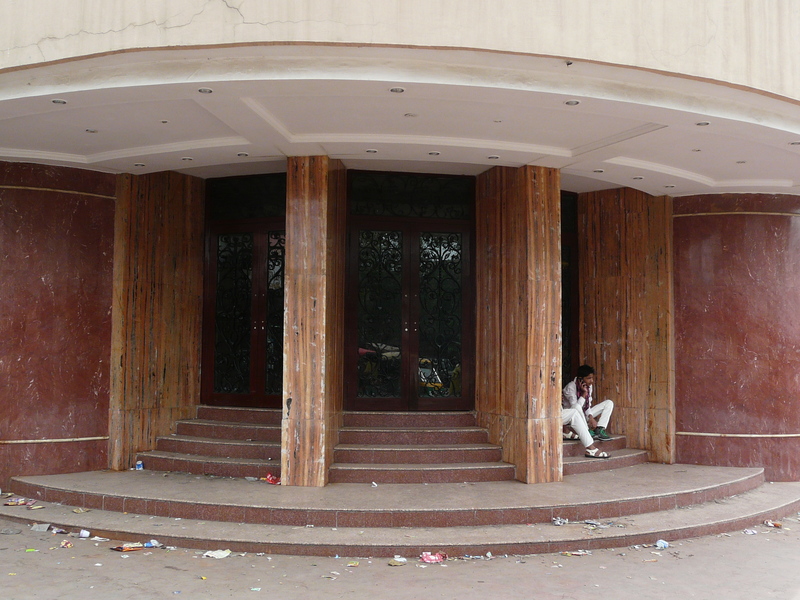 The front entrance hardly looks like it could lead to a theater, but the decorations around it’s side exit show that it was built with some amount of care. 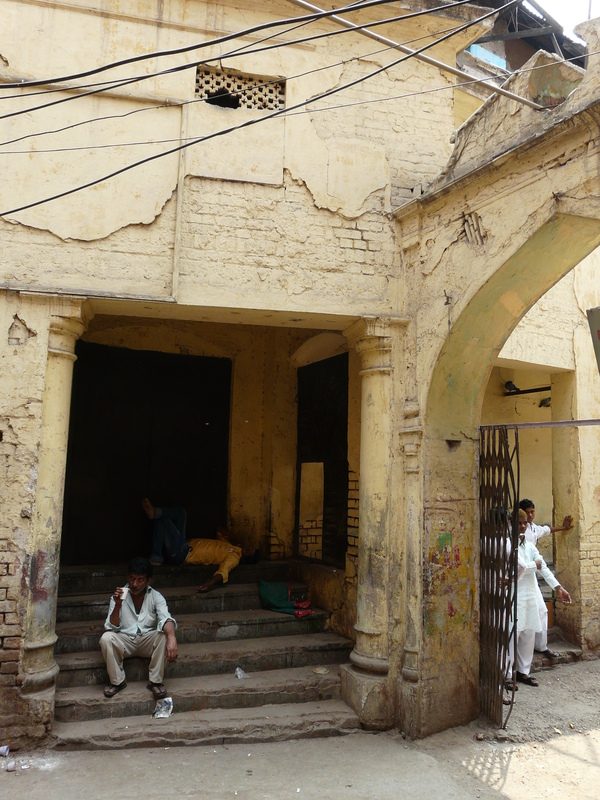 Amba, further north of Robin along GT Road, is much larger and comparatively more recent. 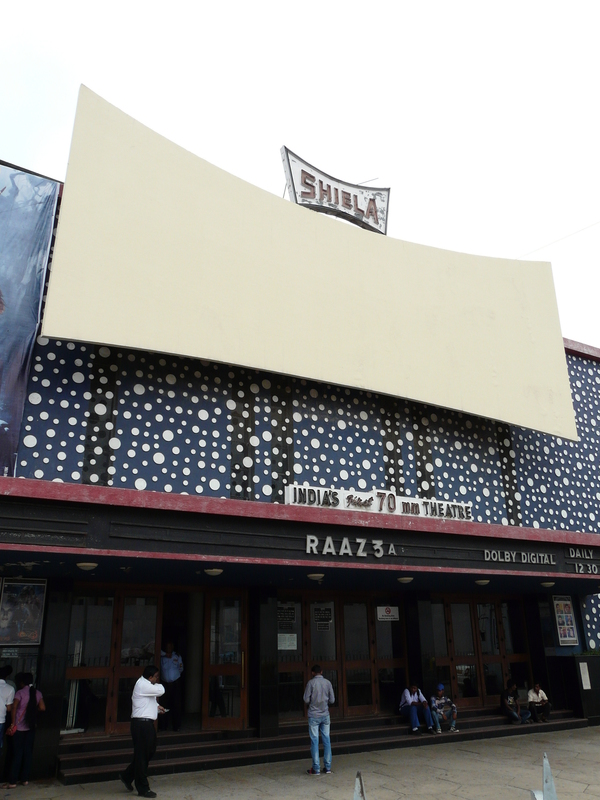 The stretched-rectangle “screen” motif seen at Shiela is repeated here as well, and was probably used to symbolize the large size of the screen inside. The “scoop” at the back of the building, giving the building a modern and unified feel, is quite nice. 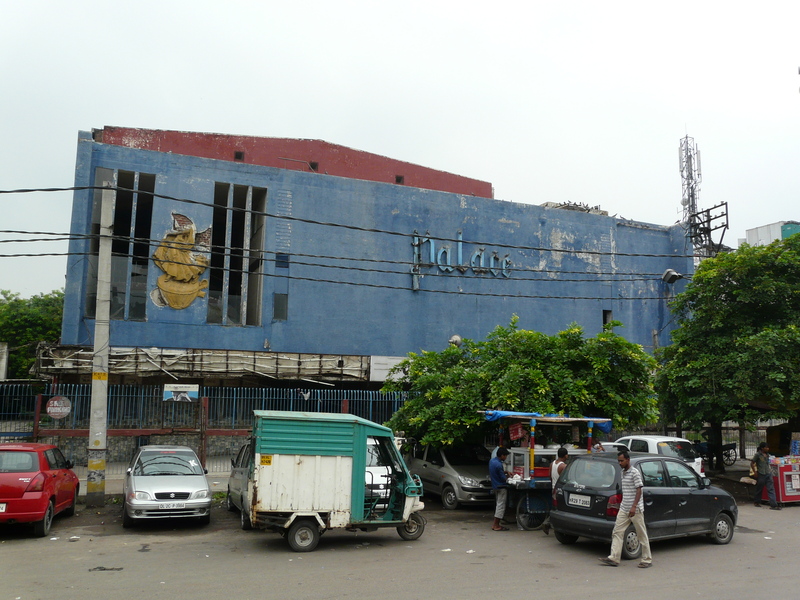 So some of these theaters are doing okay, and some obviously are not, but none of them – not even the currently most successful ones, have been given the latest “multiplex” facelift (unlike the Connaught Place theaters described below). 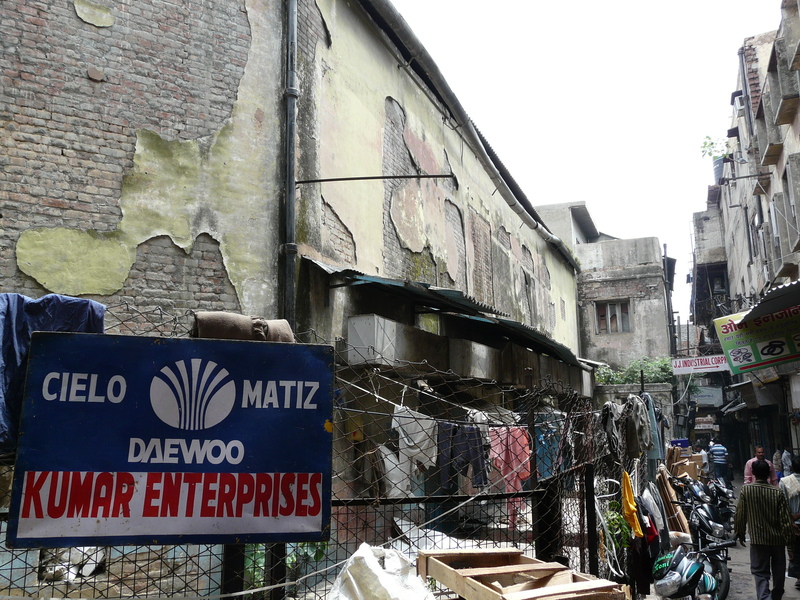 This is an indication of how Old Delhi and it’s surrounding areas are not really and directly a part of the “success story” of liberalized India/Delhi that has taken shape since the 1990s. 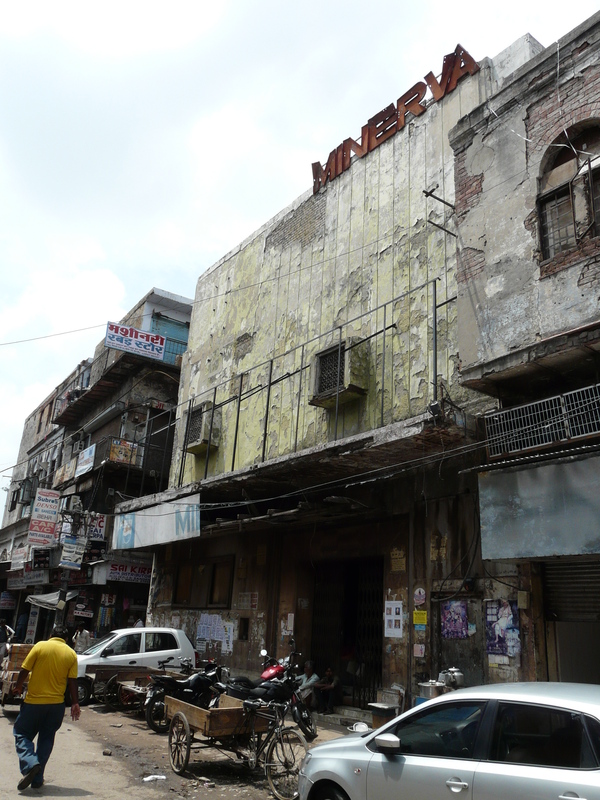 The nature of commerce that takes place in Old Delhi has changed since then, as has the fate of it’s cinema halls. 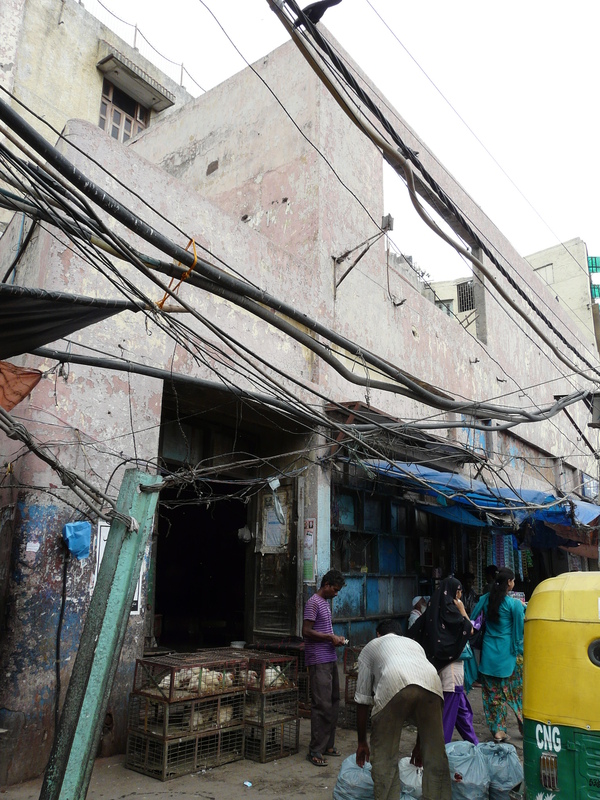 No longer is Old Delhi the cultural heart of Delhi, but instead has turned into a place where hard commerce and wholesale trade take place, and small and medium scale industries have their outlets (since the factories themselves have been mostly phased out). 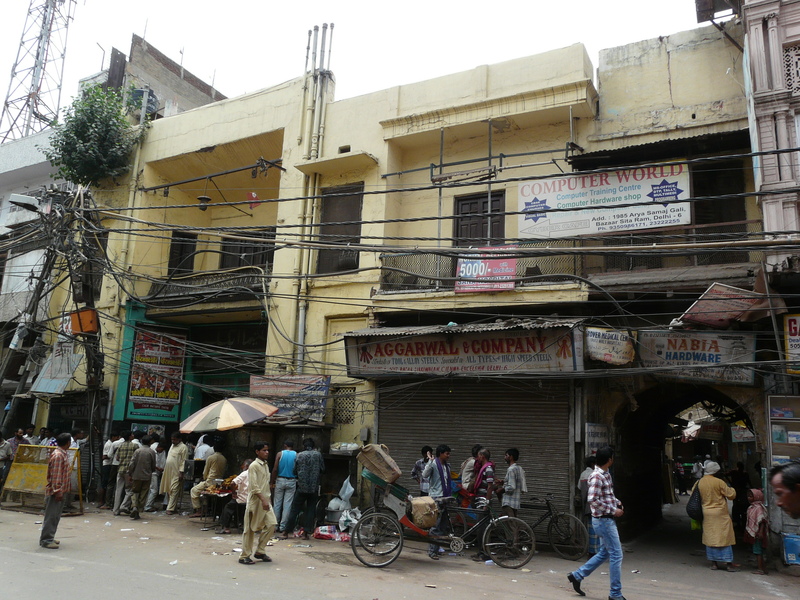 People might make a trek into Old Delhi for particular shopping needs (many having to do, for some reason, with weddings), but this is an outcome as much of lingering traditional family ties with particular sets of retailers than any other advantage Old Delhi might hold over other places. 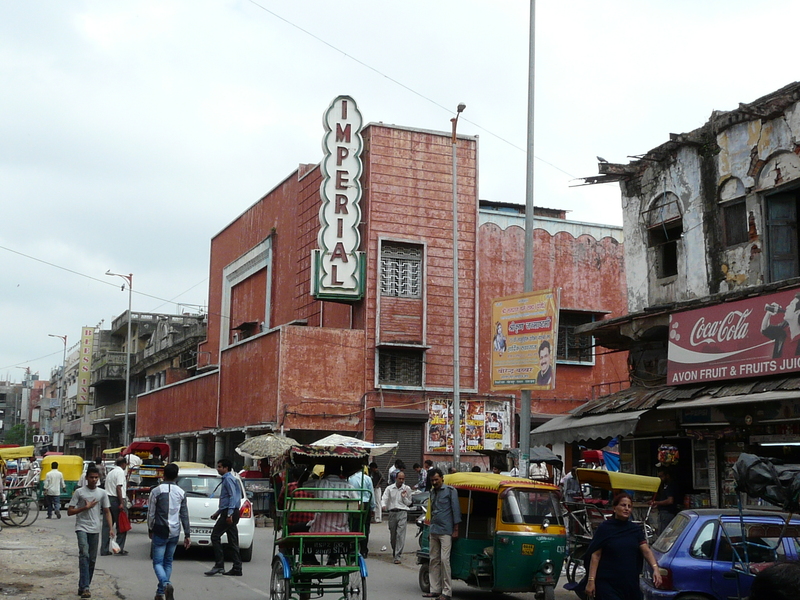 It is definitely no longer the place that people go to catch the latest Bollywood or Hollywood release and enjoy an evening out (unless that evening out involves “experiencing” the uniqueness, in an urban sense, of Old Delhi), as it would have been in the 1950s and 60s. 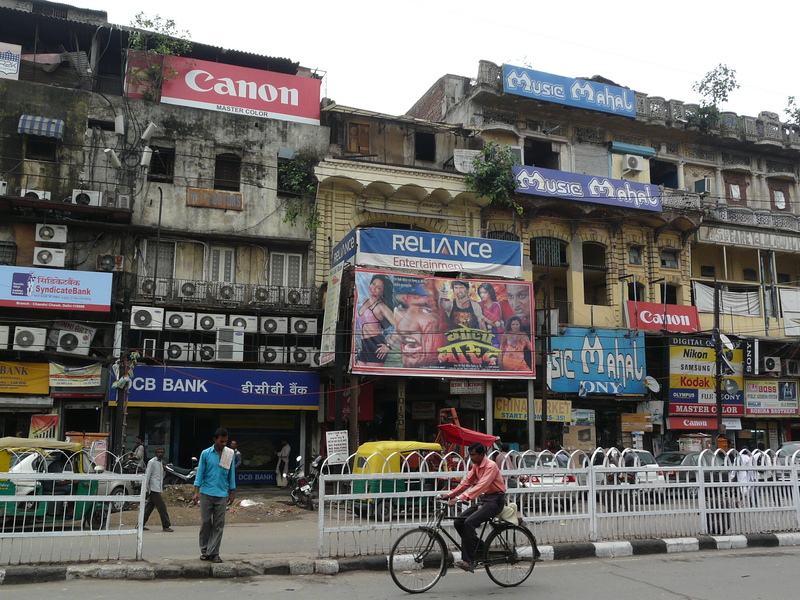 There are altogether too many other and newer centers/outlets of commerce, retail and entertainment in Delhi for Old Delhi to remain dominantly relevant in those regards. 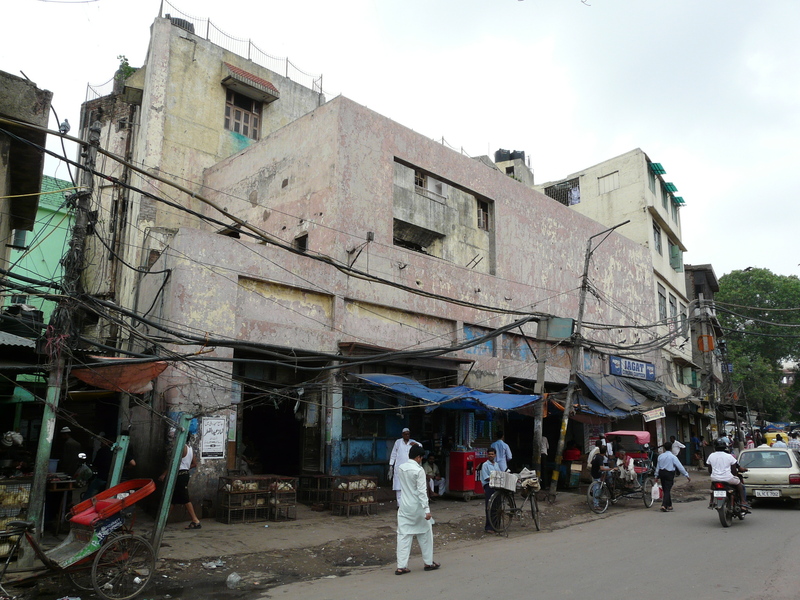 An interesting anthropological research project will be to find out how exactly the nature of commerce has changed in Old Delhi since independence, both qualitatively and quantitatively. 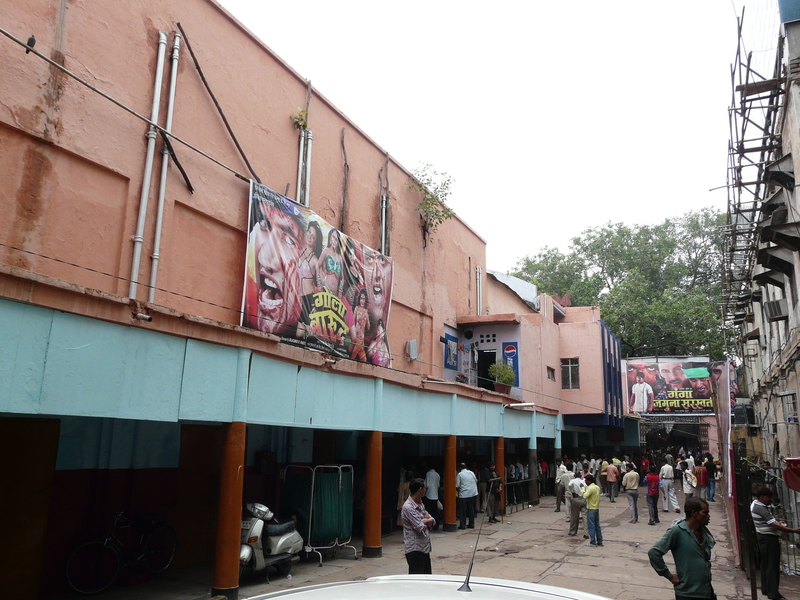 With all this in mind, the “catchment area” of patrons for Old Delhi’s cinema halls has reduced to a much more localized audience. This is why so many of the theaters have shut down, and why others have to make do with showing old B movies and pornographic or semi-pornographic “matinee” shows. The ones that are thriving are those that have been able to captured the reduced and localized catchment area. Because so many of these theaters have not been “upgraded”, or not upgraded completely, they still harken back to a time when going to the movies was a special event – like going for a picnic, and not just a routine regular occurrence. 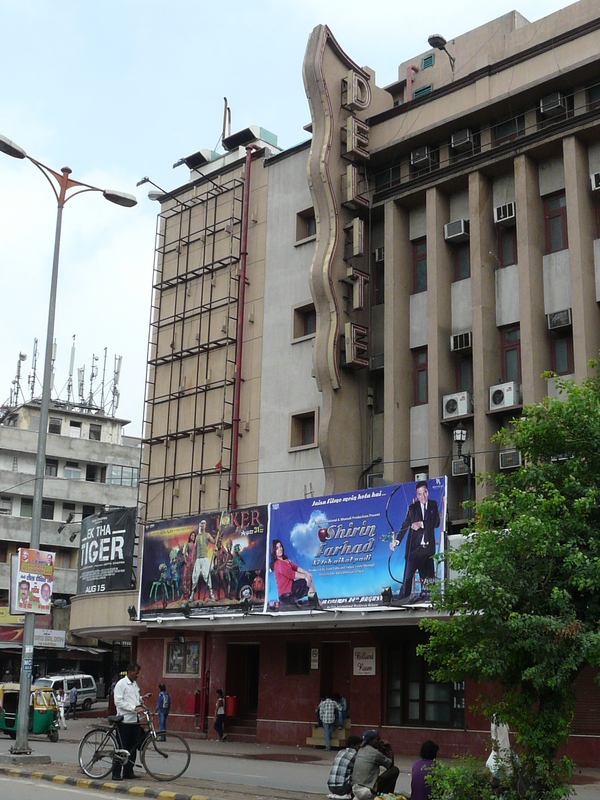 This is reflected in the “distinctive” facades of so many of these theaters. 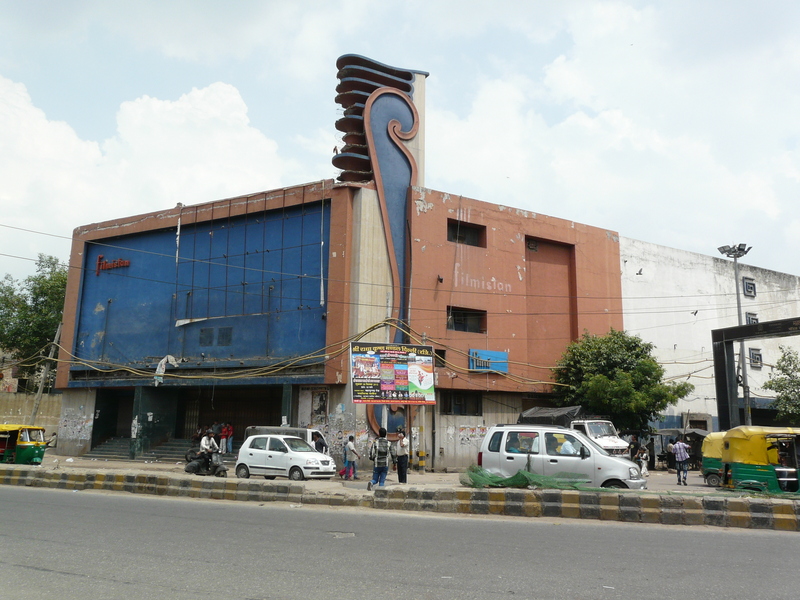 The other aspect discernible from all these cinema halls is a distinct progression in the type of cinema halls popular in Delhi at different times. Since I haven’t conducted a detailed study of the chronology of these buildings, the plotting of this progression is just a rough estimate as of now, needing more serious corroboration. 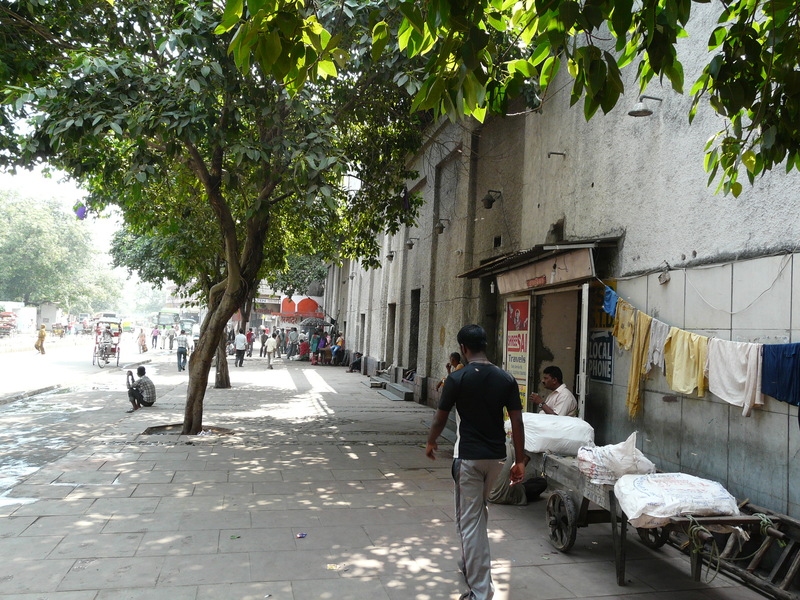 Modern, post-independence Delhi grew from the nucleus created by British New Delhi (Lutyens’ Delhi), Old Delhi (Shahjahanabad) and the areas around Old Delhi like Sadar Bazaar, Pahar Ganj, Sabzi Mandi and Karol Bagh. 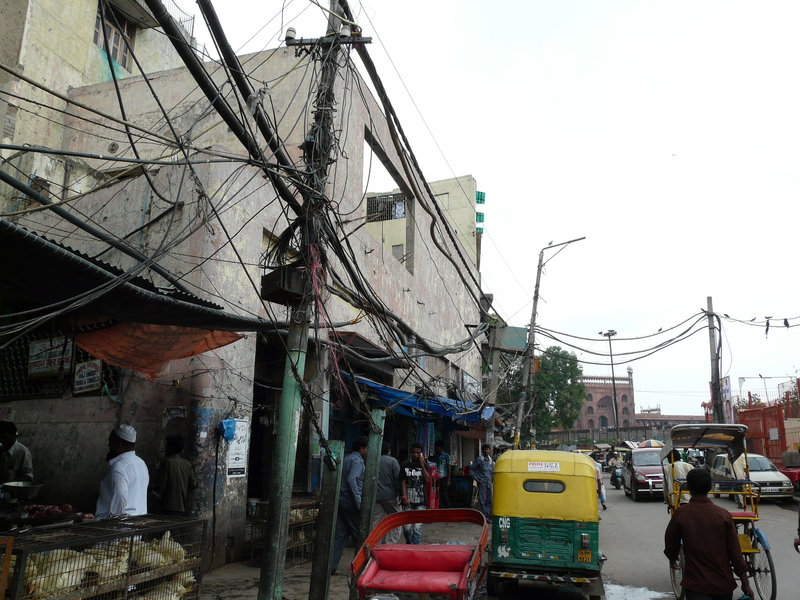 New Delhi was taken over mostly for government purposes, or otherwise consisted of large private plots and houses owned by wealthy landowners. 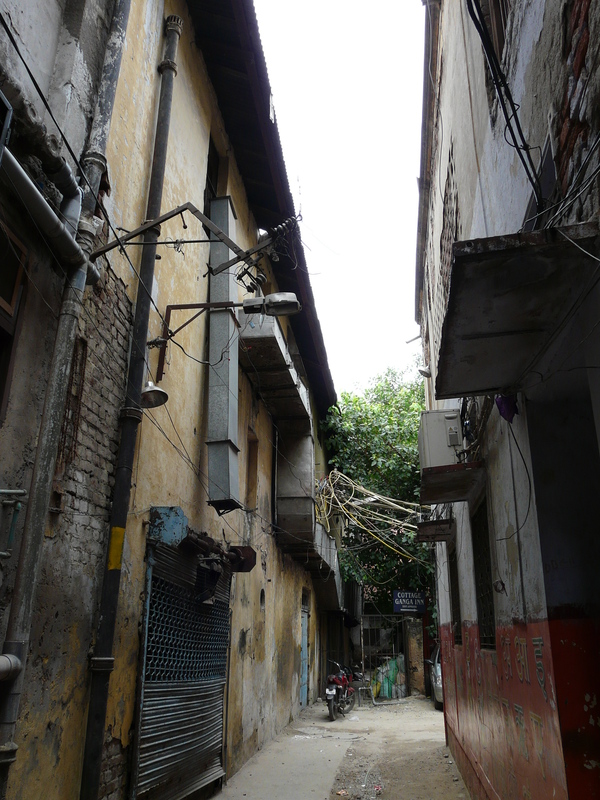 This left, initially, Old Delhi and it’s surrounding areas as the spaces for incoming refugees and new inhabitants to reside in. 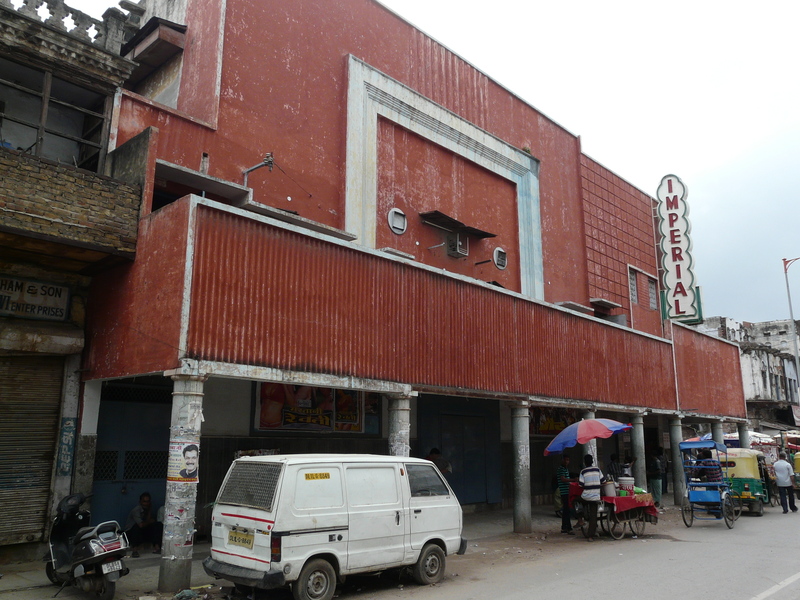 It is during this time that smaller cinema halls such as Minerva, Ritz, Excelsior, Jagat and Robin, which were completely integrated into the surrounding neighborhood, would have come up. 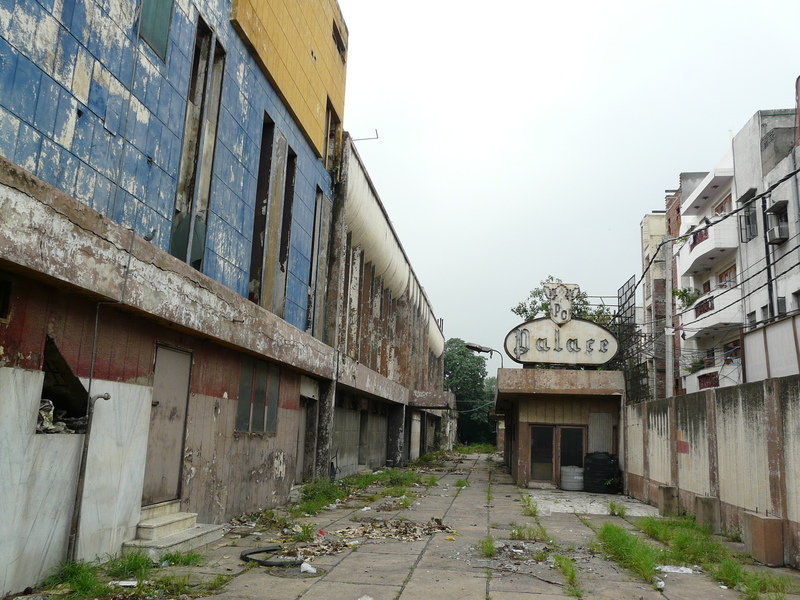 The next stage would have been the larger neighborhood theaters, probably beginning in the 1960s and 70s, which were less integrated with the surrounding urban landscape, built on larger plots with some parking space around them, and which stood out more than the earlier, smaller theaters. 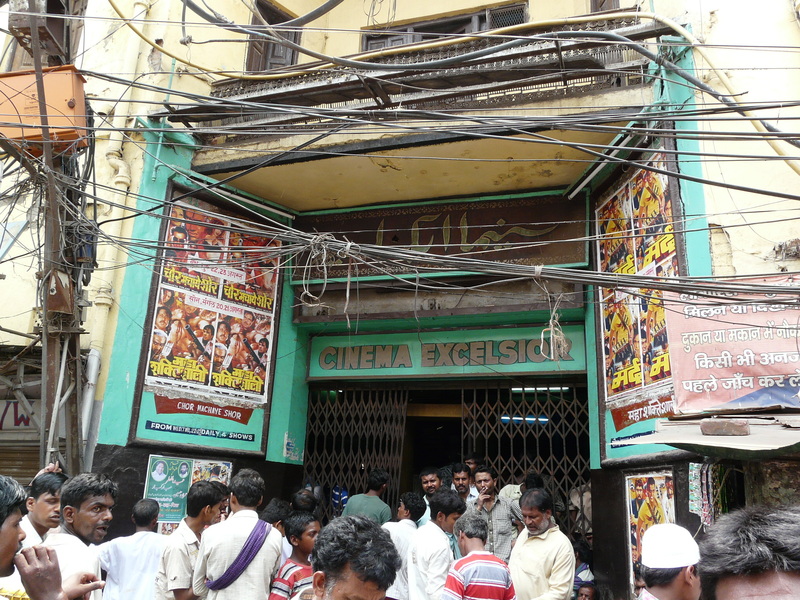 These would be theaters such as Filmistan, Shiela and Amba. 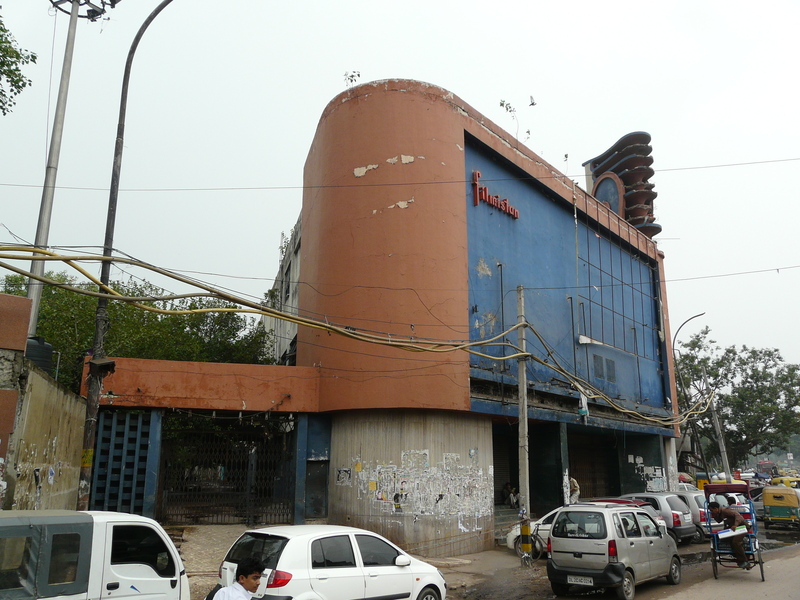 Another such example would be Alpana (or Alpna as it seems to have been spelt), in the Model Town area of north Delhi, with more modernist tendencies, but still with a dramatic and iconic facade to symbolize the occasion of movie-going. 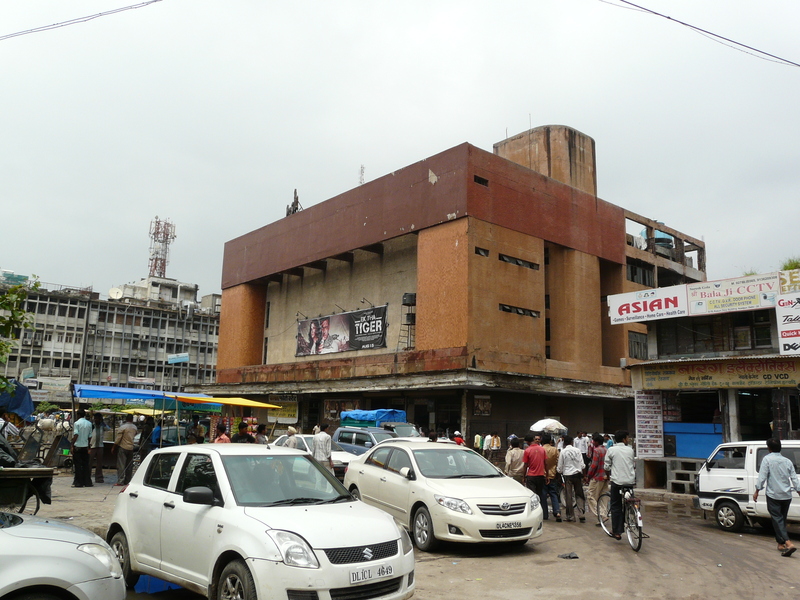 In the 1980s, with the introduction of the CBD (central business district) concept in urban planning, the construction of these large cinemas seems to have shifted from residential neighborhoods to the CBDs. 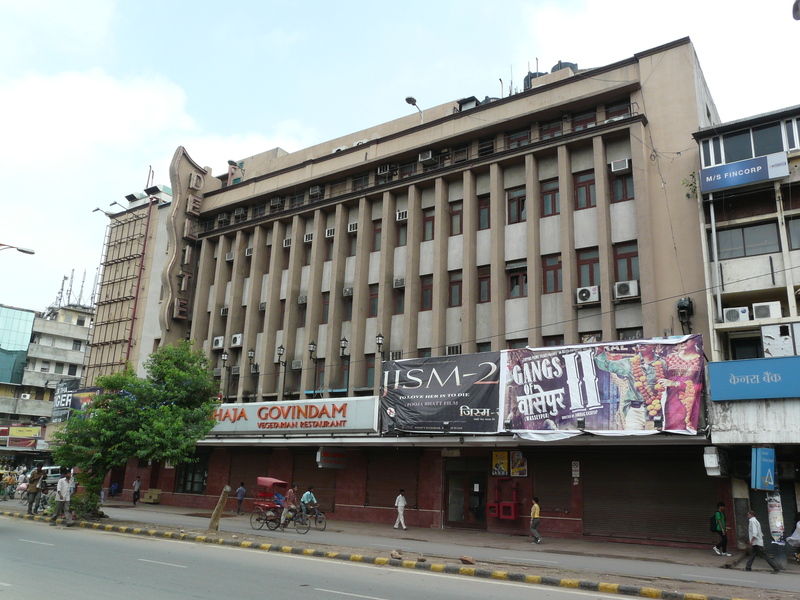 Many of the south Delhi cinema halls that became popular in the 1990s and early 2000s such as Priya (Vasant Vihar) and Anupam (Saket), as well as Satyam (Nehru Place) were from this period. 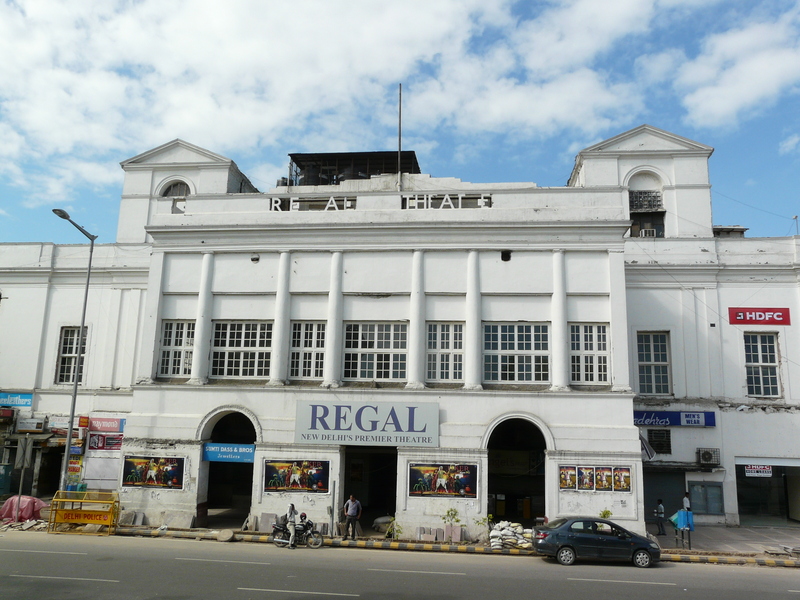 Many of the theaters from this era have been given the “multiplex” treatment, and even if they haven’t been converted into actual multiplexes, have been upgraded to the flashy but generic design of cinema halls prevalent today. 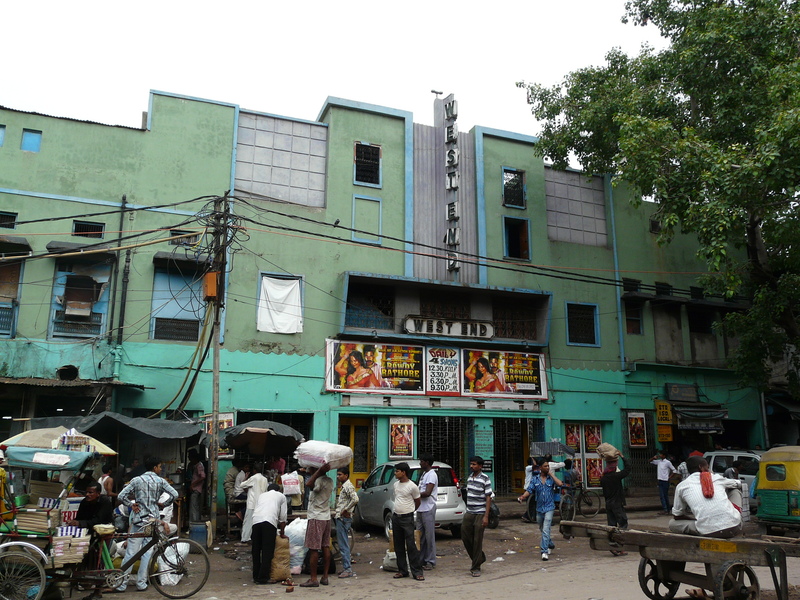 Some examples of these “CBD cinemas” closer to Old Delhi are Aakash near Azadpur and Milan in Moti Nagar. These two have not been given the multiplex treatment yet. 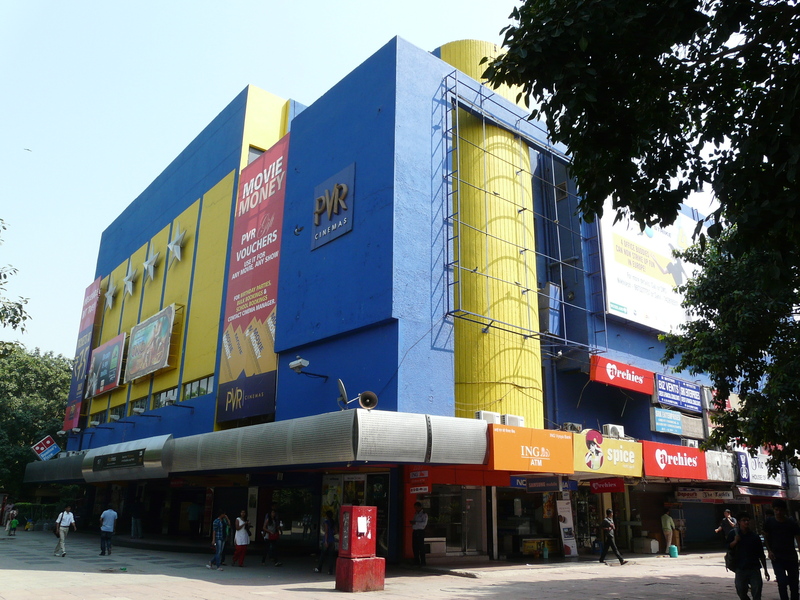 The latest trend since the 2000s of course has been multiplexes inside shopping malls. 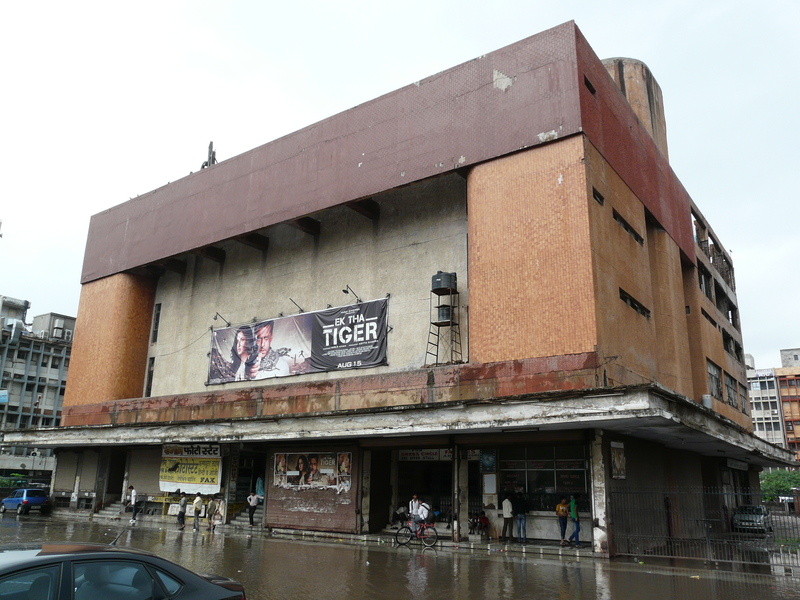 The only way to keep up with these is to upgrade the old cinema halls, which many CBD cinemas have been able to do, but not older theaters. The alternative is cheaper tickets, and older/cheaper B movies. 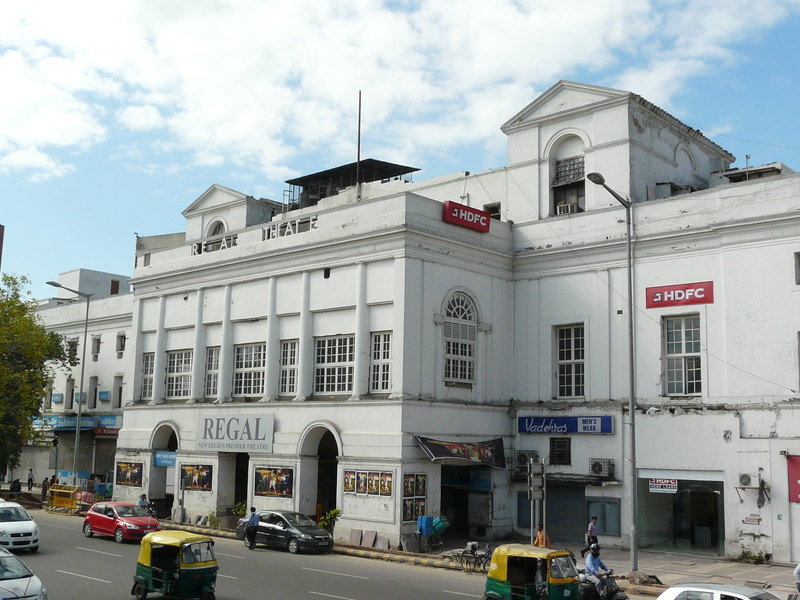 I couldn’t write this post without mentioning the movie halls of Connaught Place, with at least Regal cinema being older than any of the others mentioned above (from the 1930s, originally mainly for British audiences). 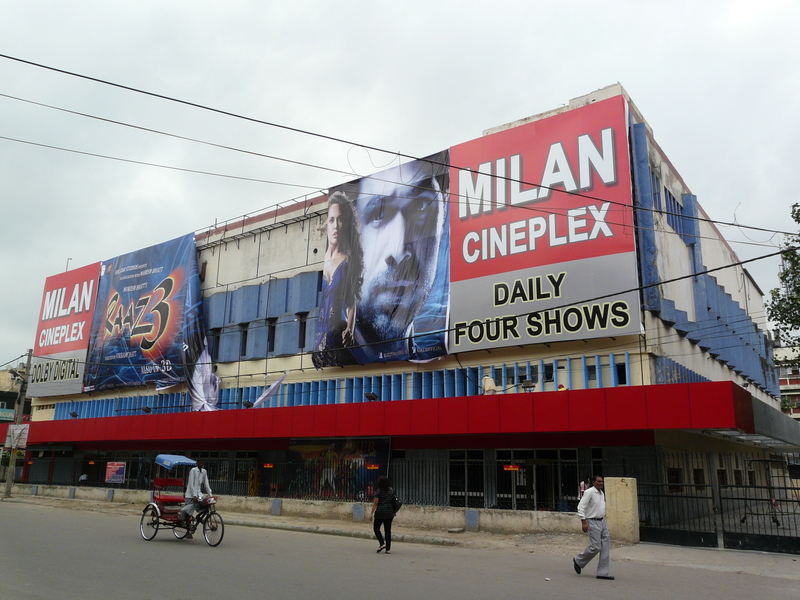 The other three CP cinemas (Rivoli, Plaza, Odeon) have all been given the new flashy treatment, and the same will probably happen to Regal eventually. 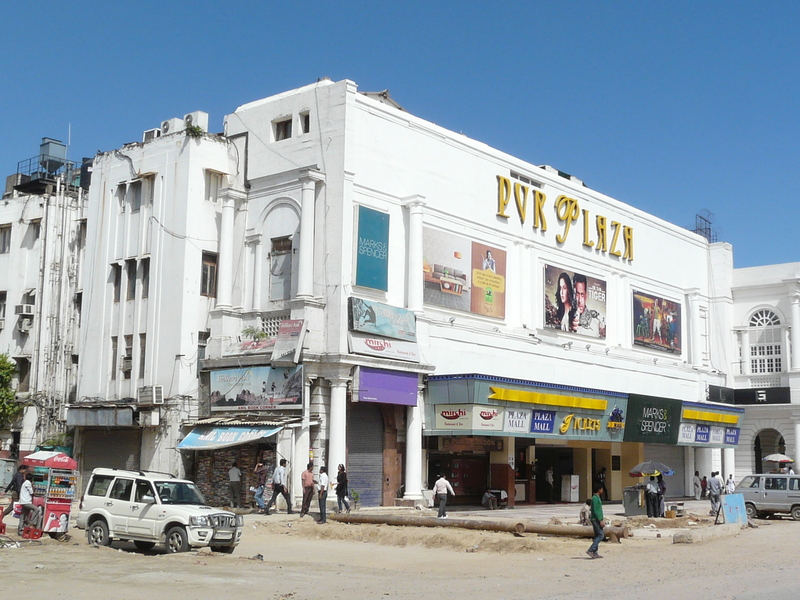 These upgrades are a sign of the revival of Connaught Place over the last few years as a commercial and entertainment hub. 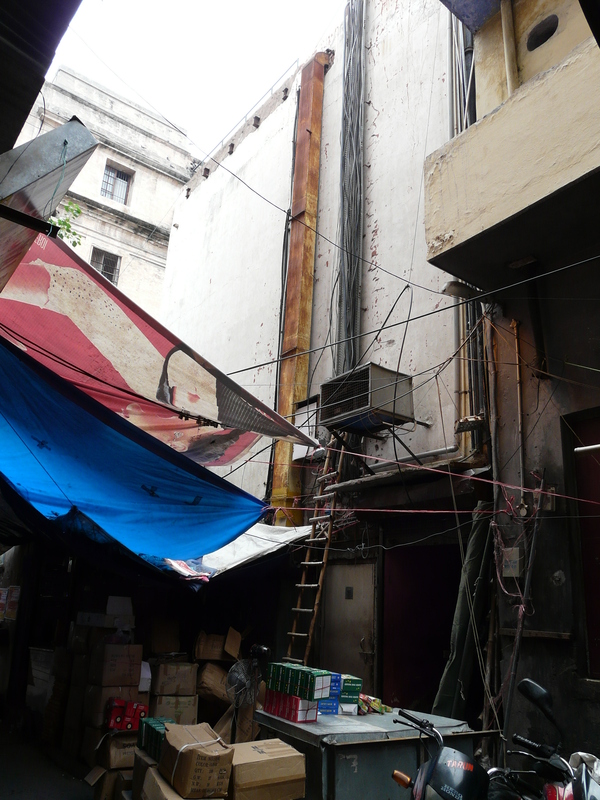 If the area around Plaza looks like a wasteland, it is because of the enormous and seemingly endless utilities upgradation project that the municipal authorities have taken up at Connaught Place. 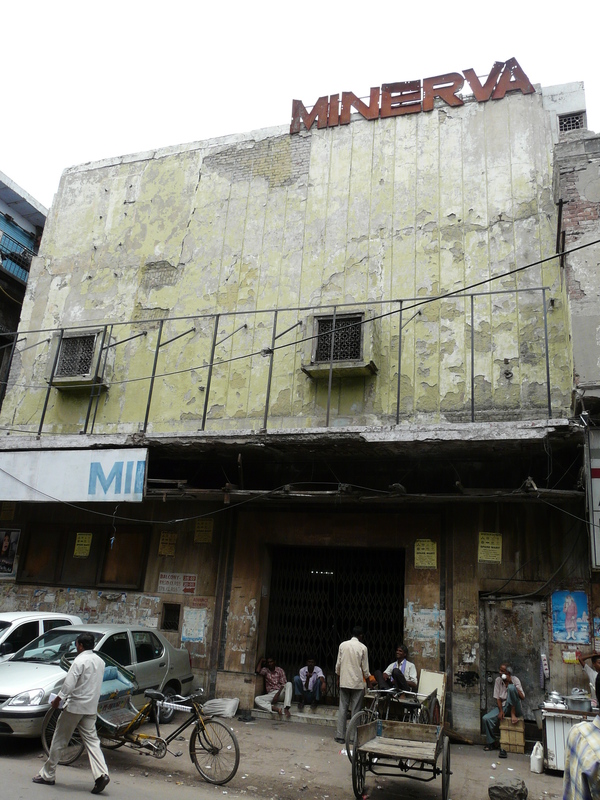 Coming back to Old Delhi for a bit, there are a few cinema halls in the old walled city that have recently been demolished, which is one of the reasons I thought I should photograph the remaining ones – since many of them look like they’re ready for demolition as well! 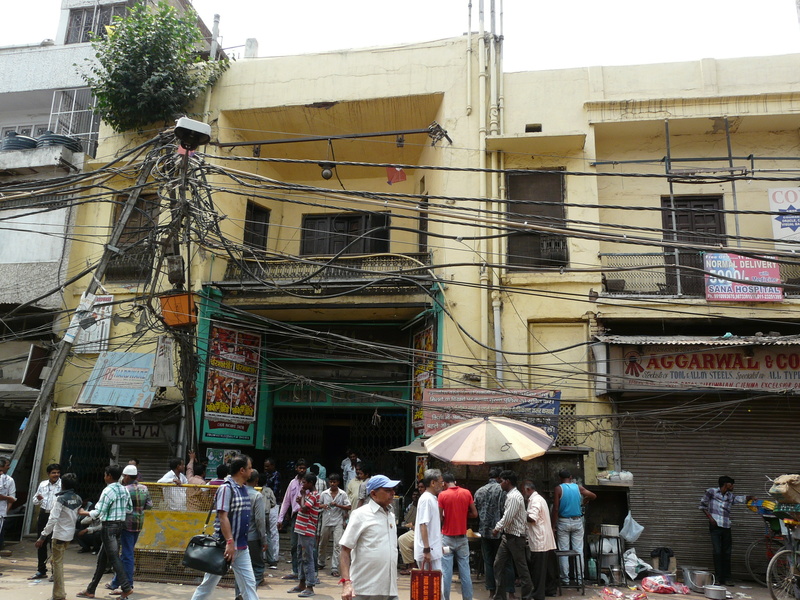 At Fountain Chowk on Chandni Chowk there were Majestic and Jubilee. 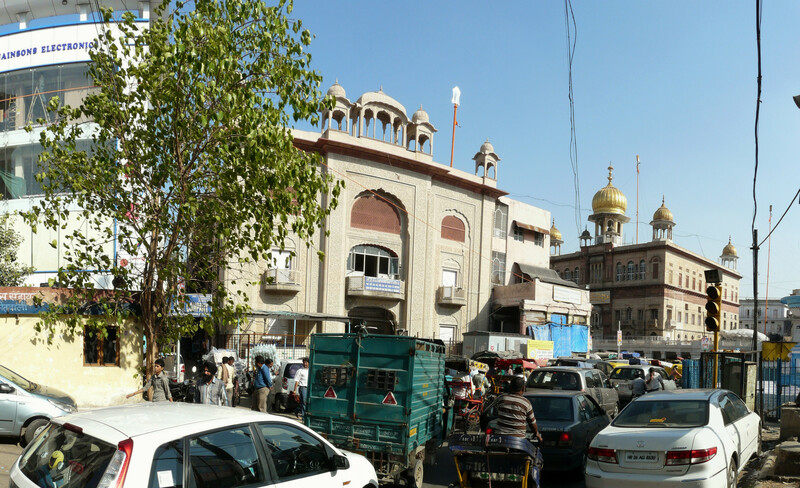 The former is now a “Sikh museum” near the historically important Sisganj gurdwara, and the latter is a construction site. 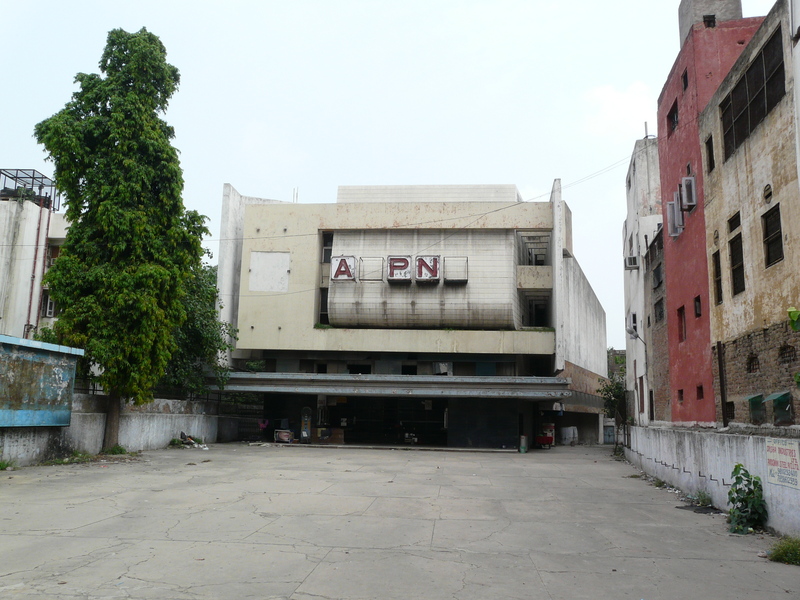 The fate of Neuman cinema near Hauz Qazi Chowk on Ajmeri Gate road is ironic, because it is now occupied by the Chawri Bazaar metro station. 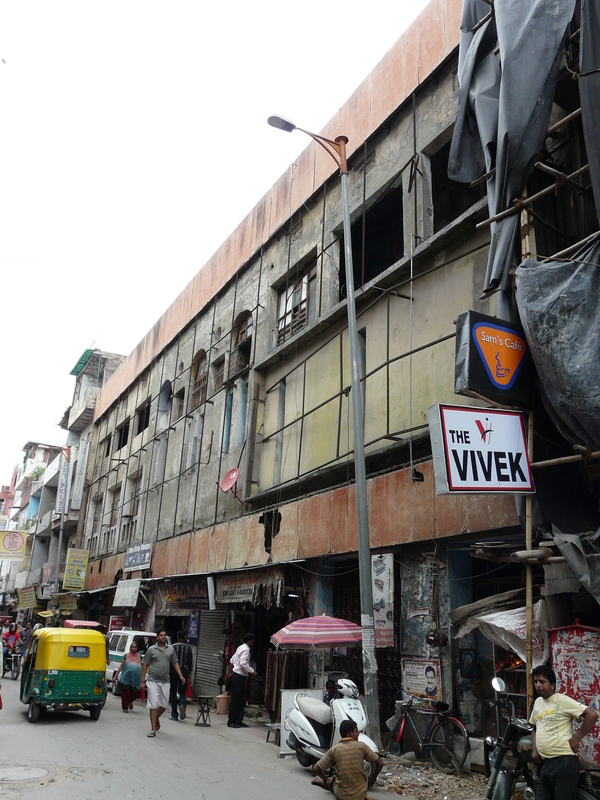 The Delhi Metro is credited with being partly responsible for the revitalization of Connaught Place, as well as making Old Delhi much more accessible than it previously was. 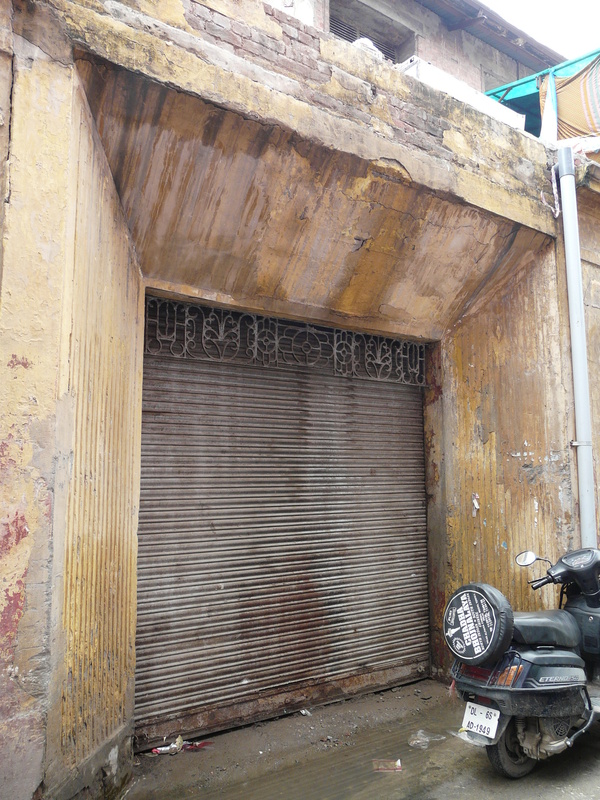 Even though this increased access is probably not going to result in the revitalization of any cinema halls in Old Delhi, it is a sign of the datedness of the neighborhood cinema hall idea that one of the possible engines of revitalization of the area was built on the site of one of these cinema halls! 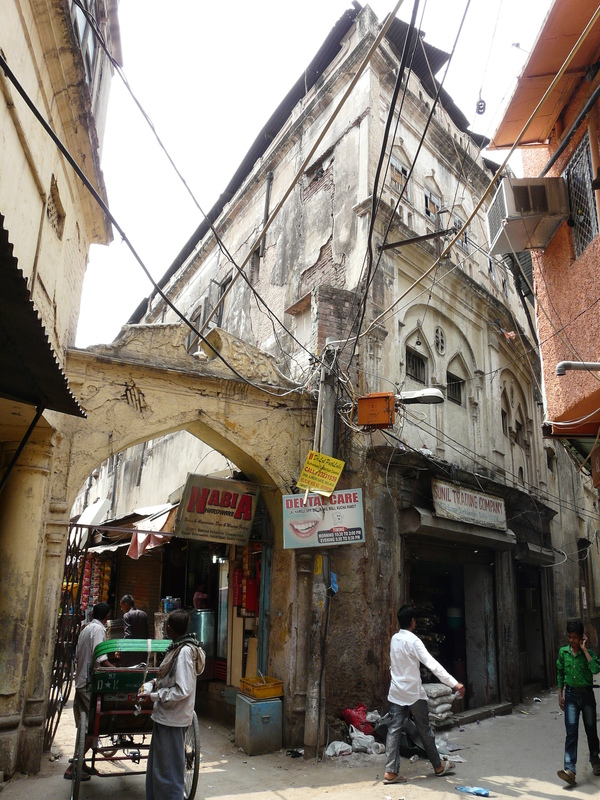 This entry was posted in Delhi, Dilli Darshan, Mid-20th c Delhi, Shahjahanabad and tagged central delhi, cinema halls, contemporary delhi, delhi, delhi history, movie halls, old delhi, pahar ganj, sabzi mandi, sadar bazaar, shahjahanabad, theaters. Bookmark the permalink. 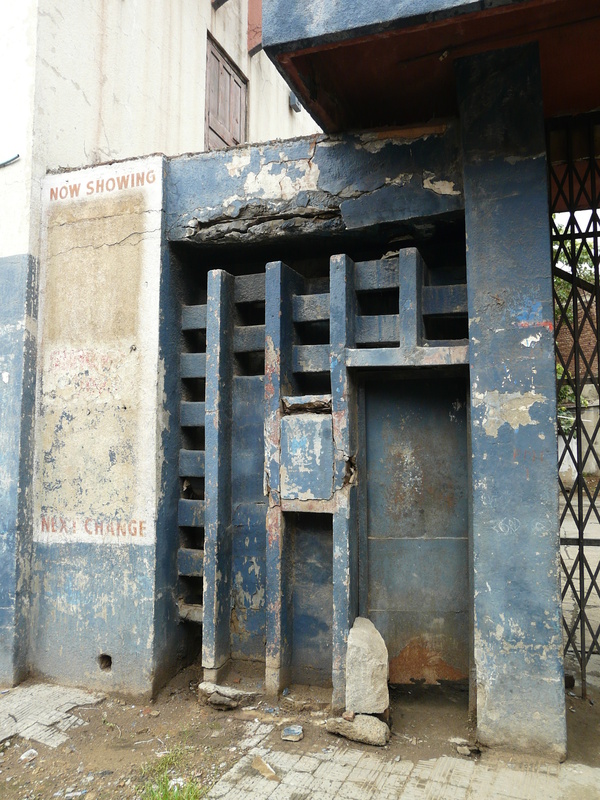 Loved this post…..loved seeing all the old cinemas halls I have been too! Ritz has been restored, and it has started working again. Yes the last time I passed by it I spotted new move posters! great efforts. good collection. i was searching for majestic. thanx. 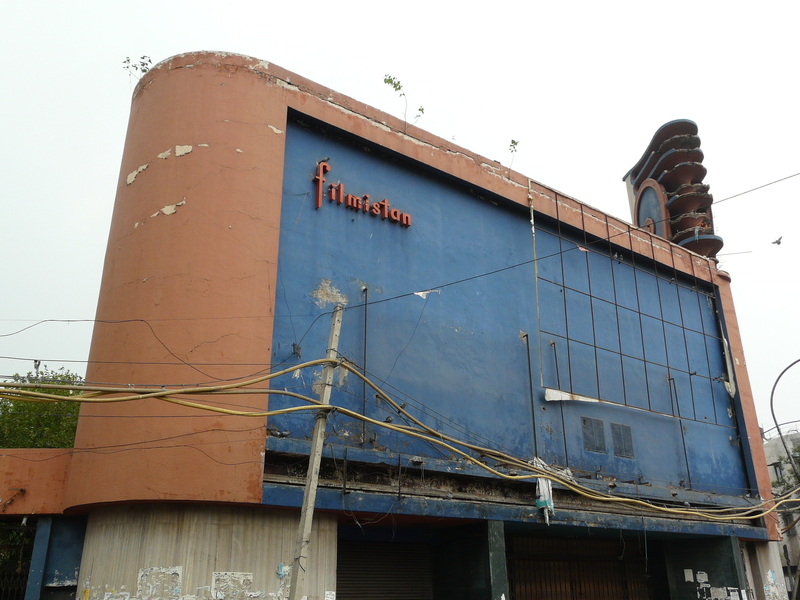 the goverment should do some thing to save theses old indian hertage cinema of delhi . 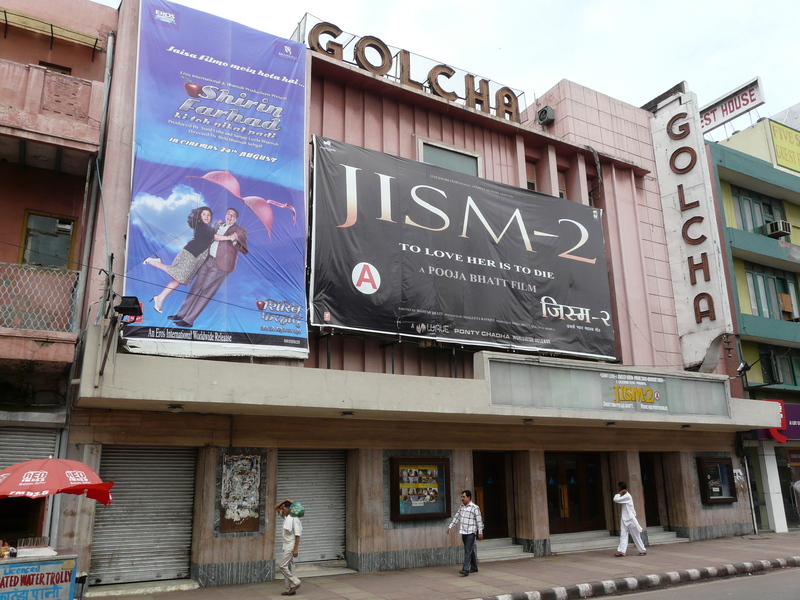 This has been a nostalgic revisit to sights and memories that nearly 35 years ago were a part of my life — at age 67 and now away from Delhi, I recall having seen films in all the CP cinema halls, also at Shiela, Golcha and Delite . A great effort, many thanks. Very impressive blog. Renewed my love for the city. Excellent photography. 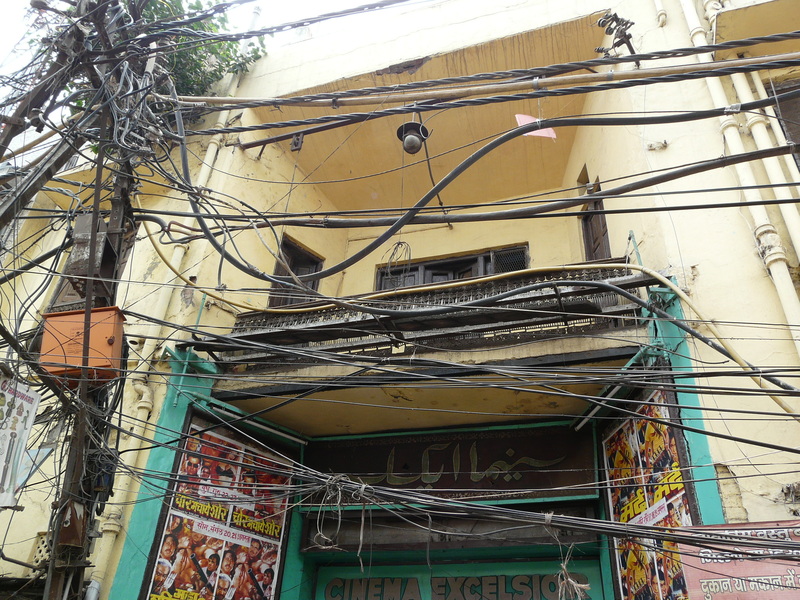 It really gives the viewer a sense of actually being there to view these theaters. 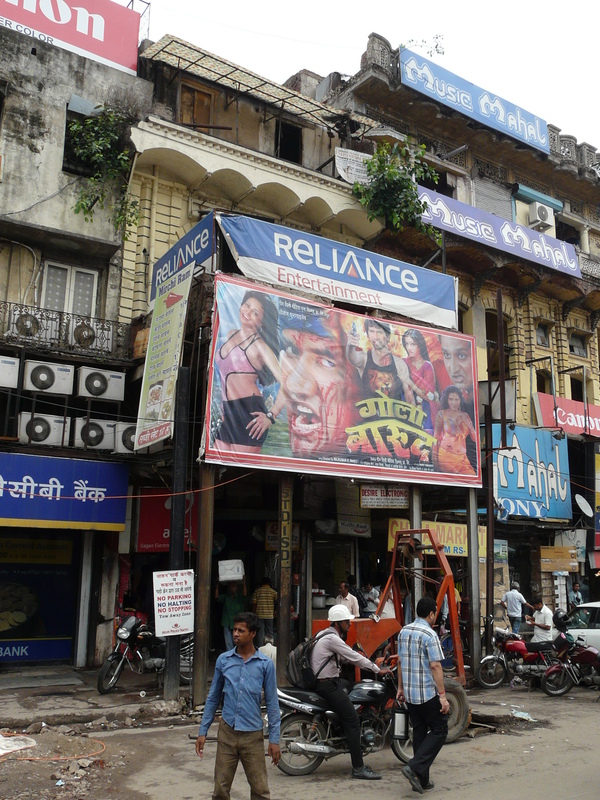 The B Grade movie you were describing at the Moti turns out is actually a Bhojpuri film. 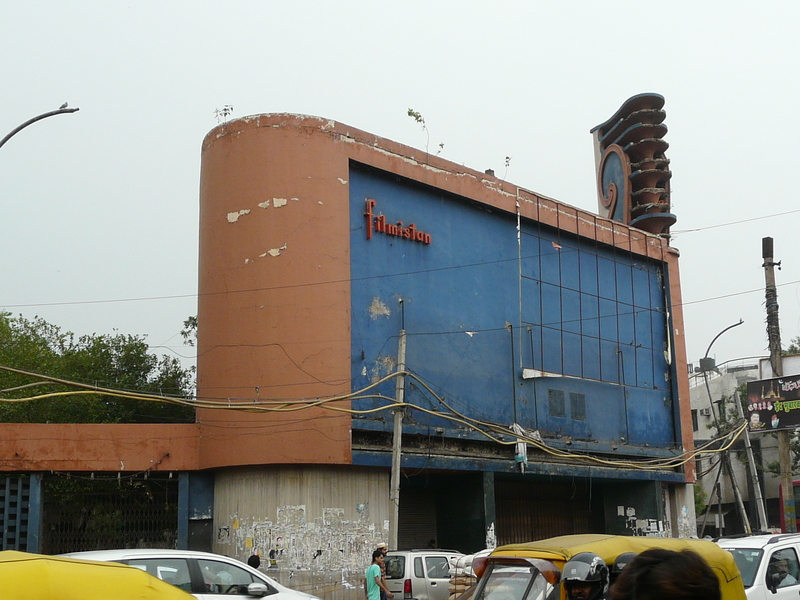 fantastic article and photos of the classic cinemas and there heydays in new an old dehli,as a visiter to india in the early and middle 1990s i know only the shiela cinema near new dehli railway station and the british era cinemas like plaza and regal in connaught place, these multi complexes might be a craze for the wannabes in india knowadays immitating the western countrys, old is gold always was and will be. 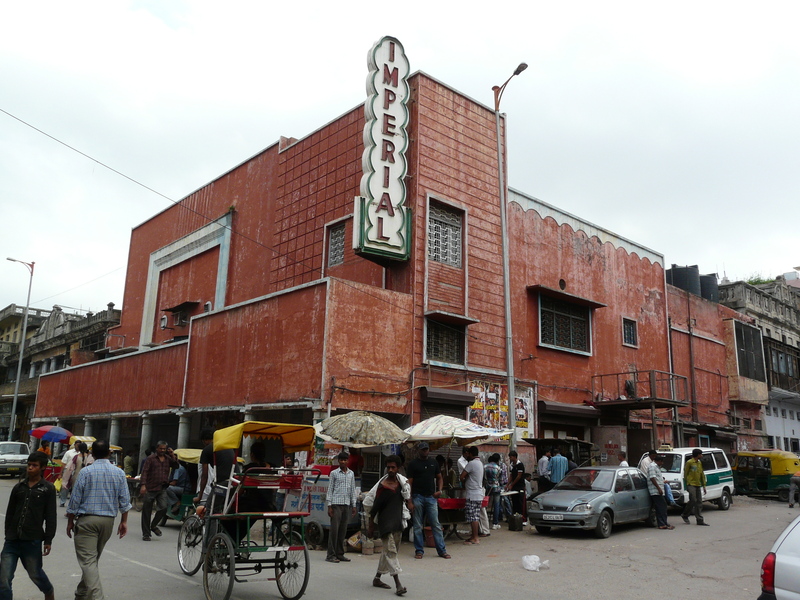 my memories of majestic jubili and moti cinema in chandni chowk are of the year 1985 when we were on a school trip of delhi. We stayed in sheeshganj gurudwara. 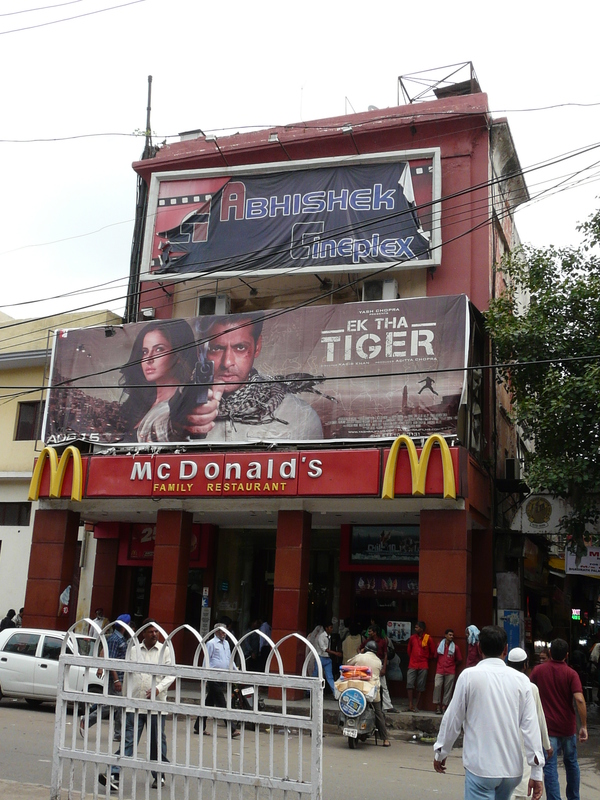 In majesic trishul movie was runnin, in jubilee sridevi starrer jadunagri and in moti main balwan movie was running. 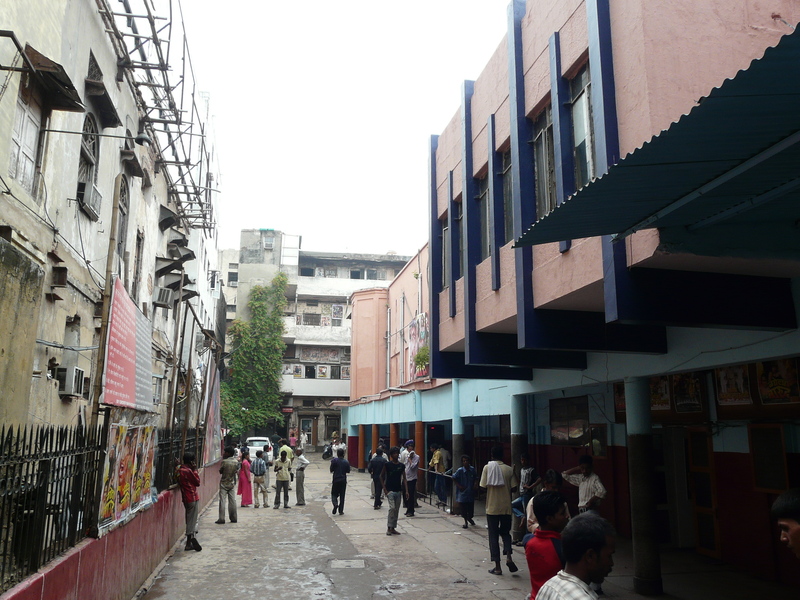 We could not watch any of them as we did not get tickets.though i have seen movies in shiela, palace,amba,alpana and aakash at diffeeent times. 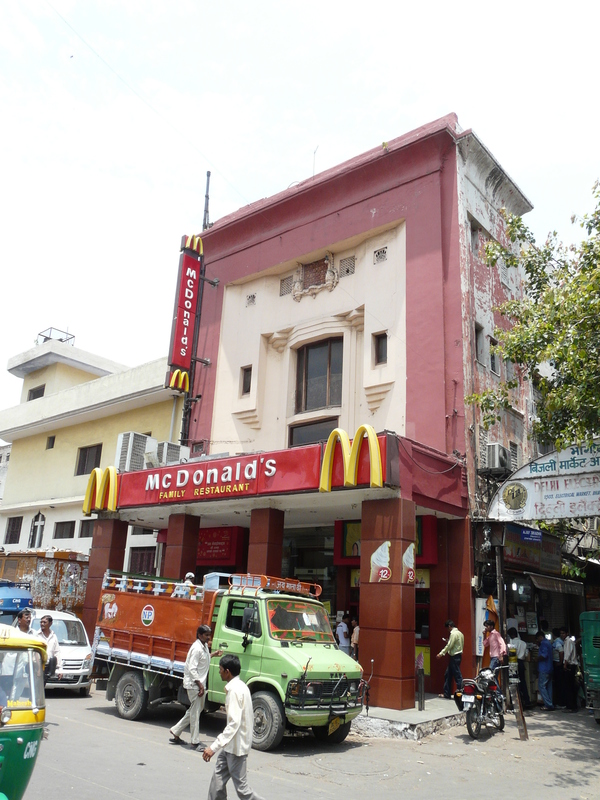 nice … i loved it…u missed Paras in Nehru Place. Thank you very much dear to recalling my old days of life …Although I have seen my second film of life in shiela Theatre in 2003 (UnfaithFull Wife)…as one of my friends dragged me into theatre forcefully because I hated watching films completely till 2011 hence seen only 4 movies in theatre throughout my life before entering into movie business in 2012 . 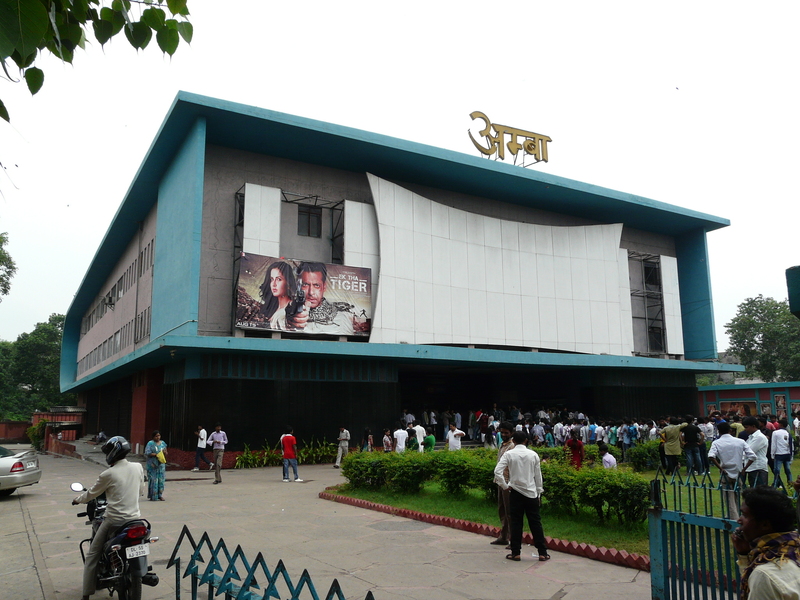 4) Vicky Donor ( 2012 ) Oberio Mall ,Goregaon East Mumbai. Fantastic blog . There is someone who thinks like me . 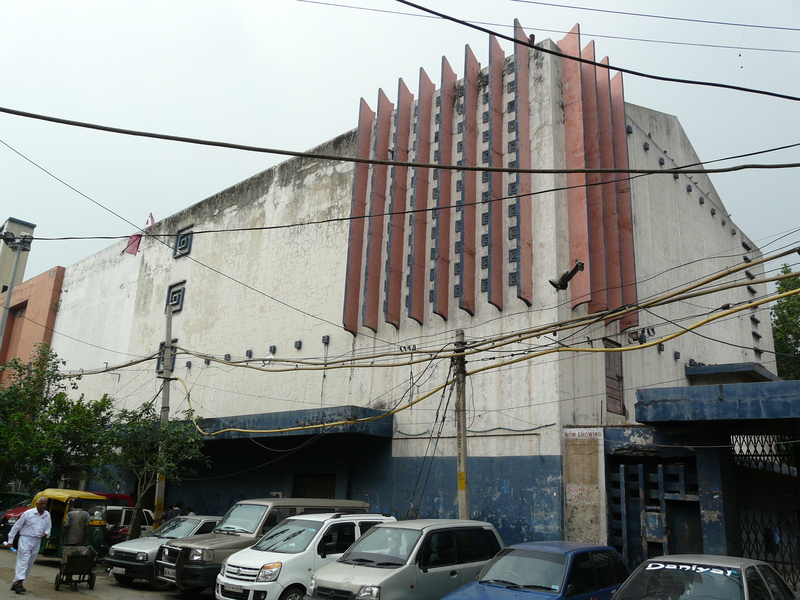 I was planning to visit these old cinema especially Jagat cinema but thanks to your blog i came to know that its closed . Beautiful article. 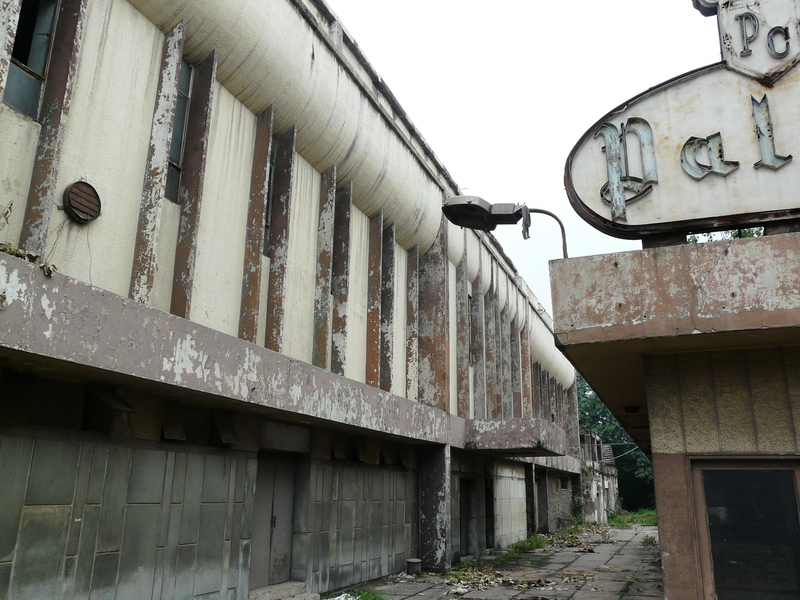 Sad to see these remnants of the glorious past, when movie going was a weekly family affair. 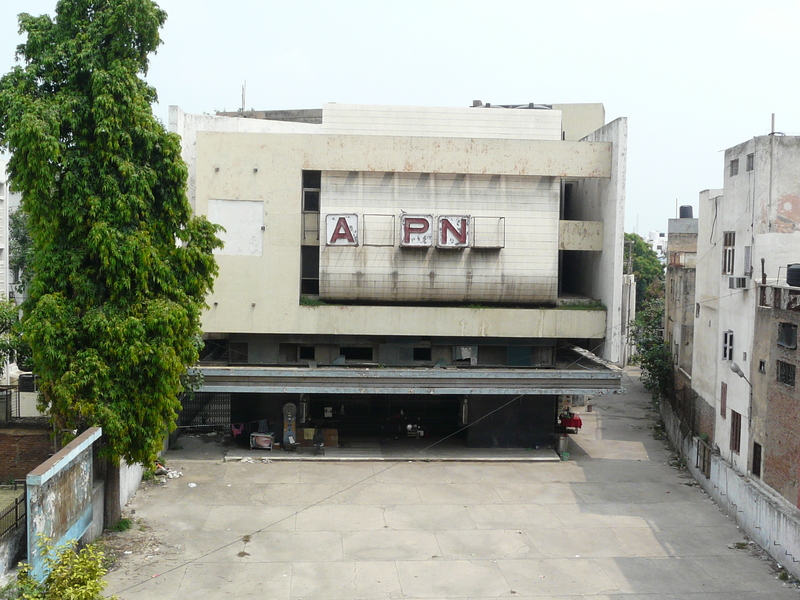 I grew up in South Delhi and Alankar and Sapna cinemas were so much part of my growing up. 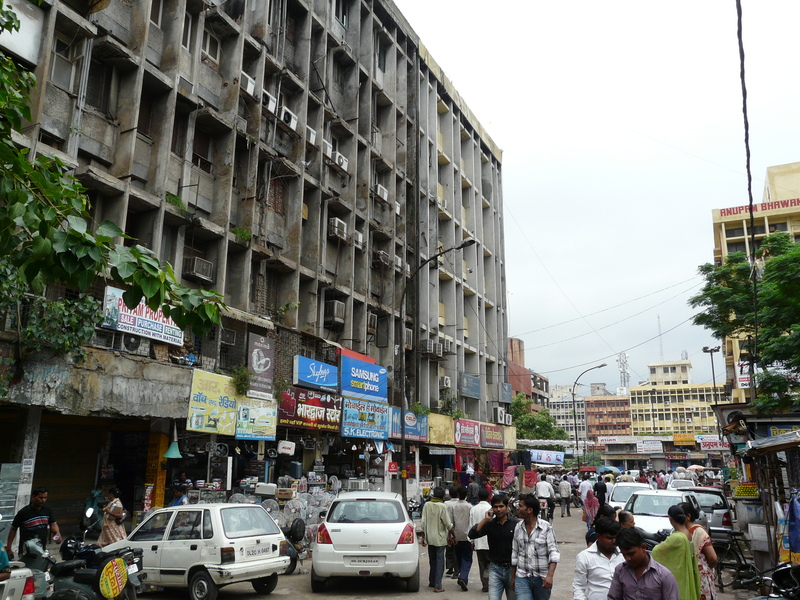 Archana and Chanakya is where I went for english stuff. 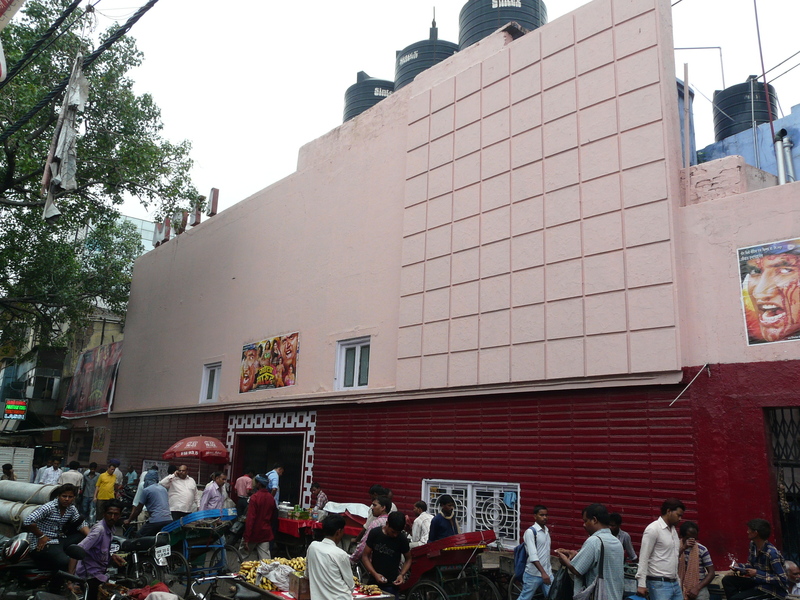 Archana ( Now the NDTV office ) had a unique telerama projection and Chanakya has a one of a kind architecture ( load suspended from the top ). 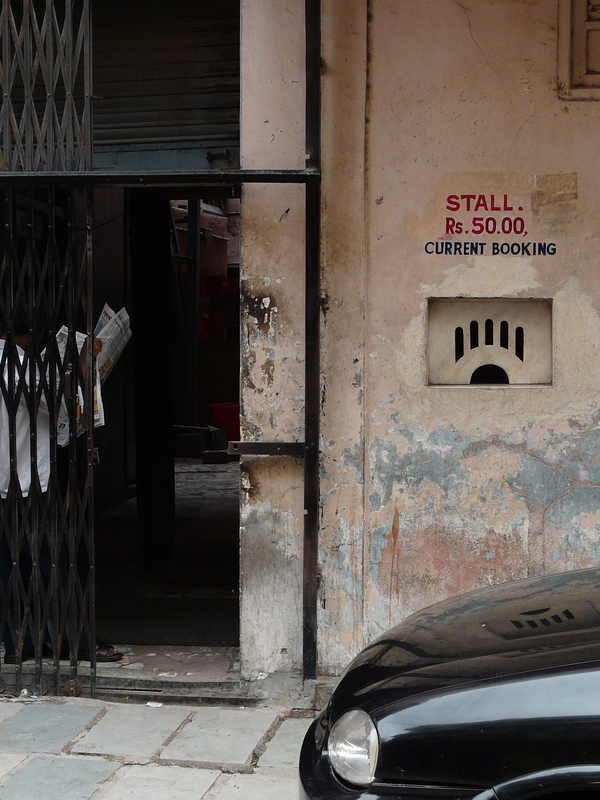 Ive even been to Uphaar, Kamal, Sangam, Paras and Savitri. 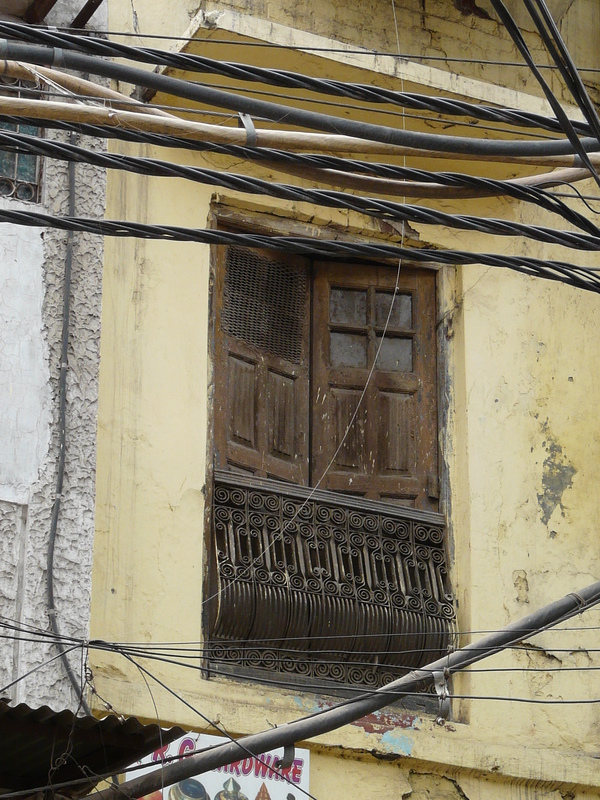 Looking at your pictures, it seems as if these buildings speak. Beautiful treasure………. 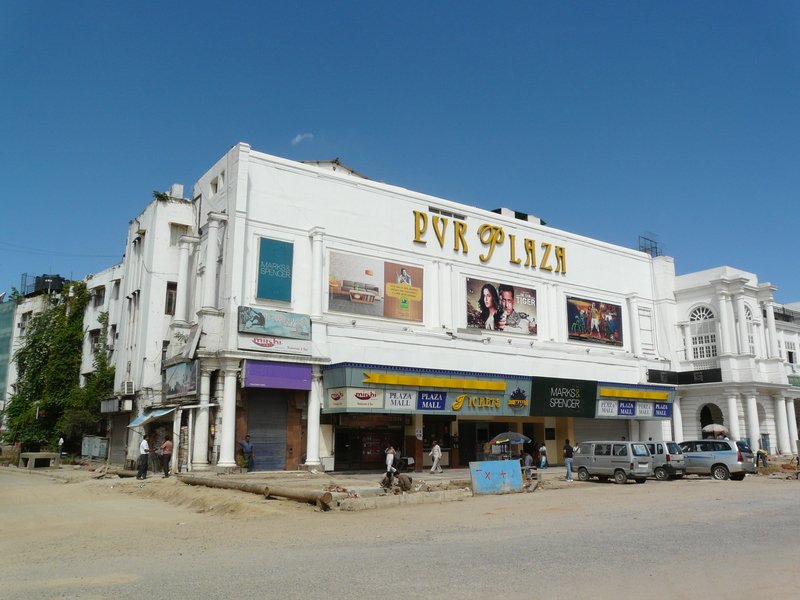 Old world charm……have seen 60s, 70s super movies in all these old beauties…… Those good old days…….koi lota de mujhe……..
BLOWN OFF! Fantastic compilation. 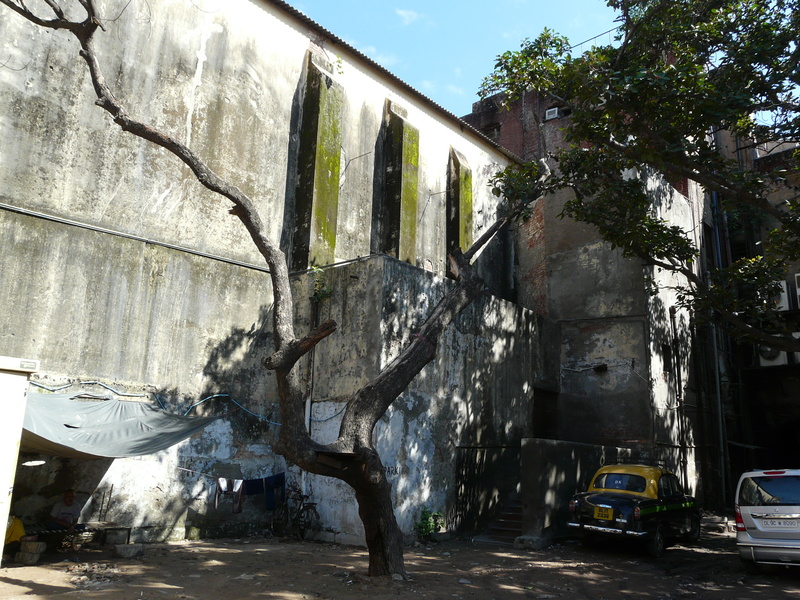 Being a student of history who also loves bollywood, it was a visual treat. 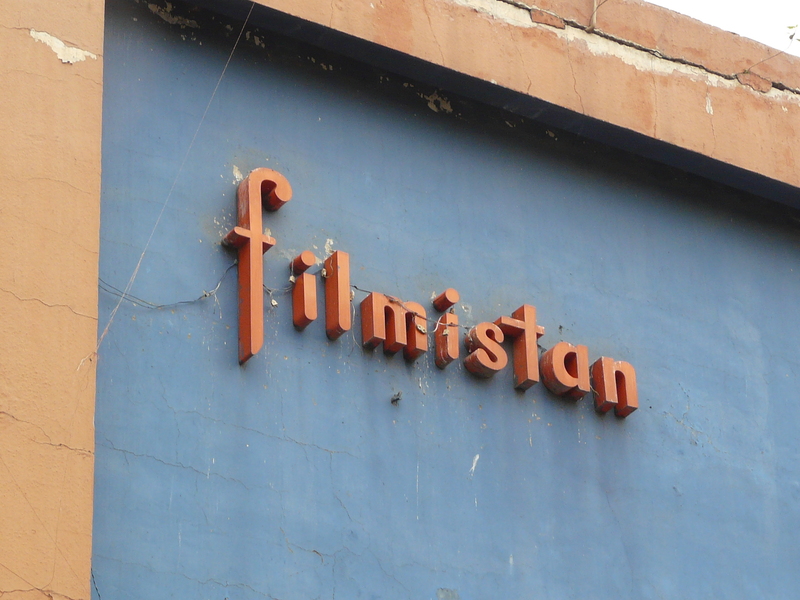 The poor state of filmistan I saw today prompted me to have a look at its history. I really wish to have a time machine and go back to see that golden era. nice collection . skoi lota de mujhe…….. 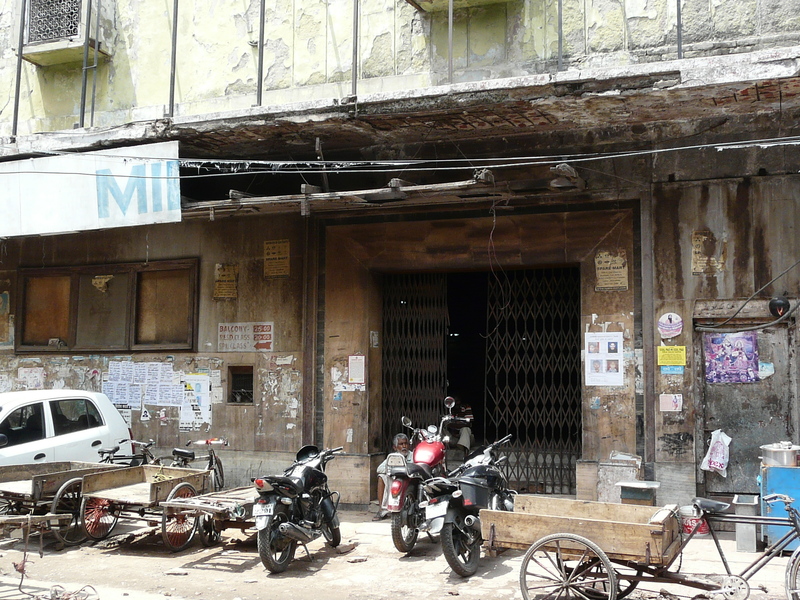 The hall at Ajmeri Gate was known as New Amar. At least since 1962 onwards. Whether is was called Nueman before that is not in my knowledge. 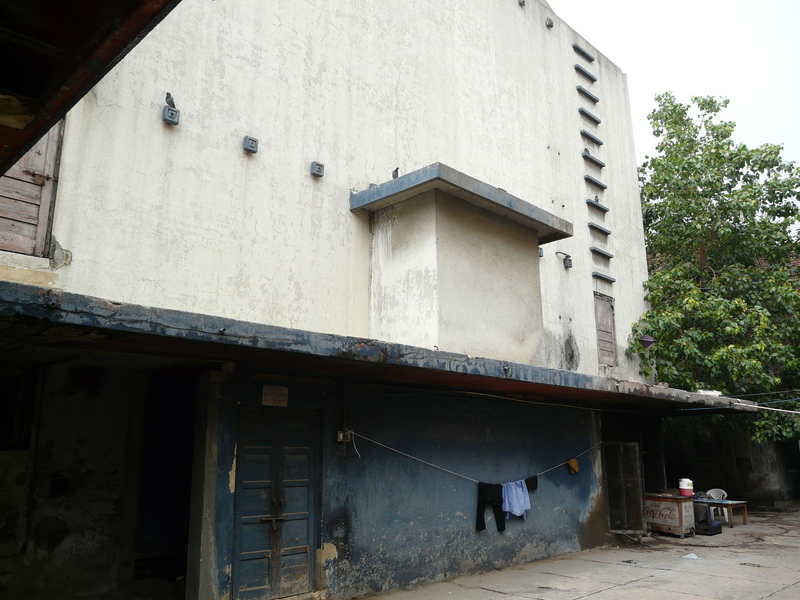 There was a cinema in 1970 s in bhogal ashram called SHALIMAR which was famous for its collection of good films. 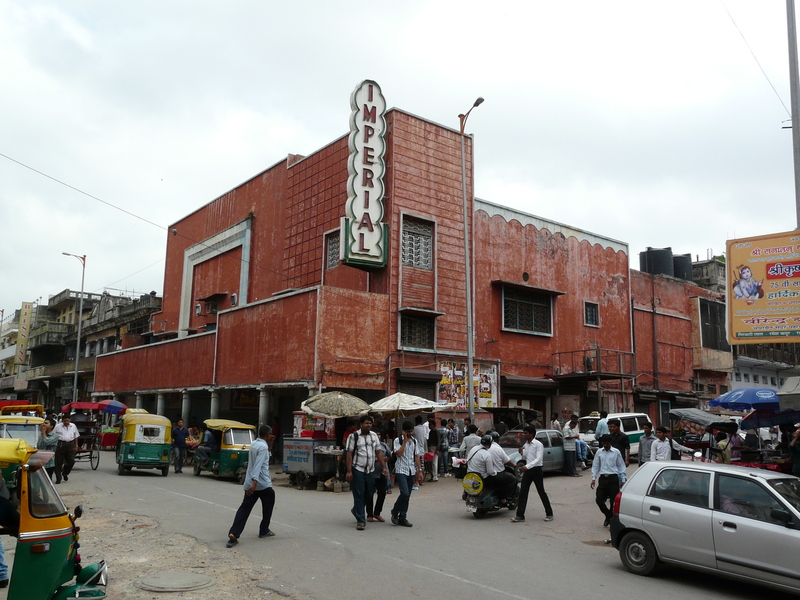 During 1965 to 1975 all cinemas of delhi were found to be gem packed and rarely tickets in current used to be available.Johny mera naam released in amba cinema many times and always shown with full house. 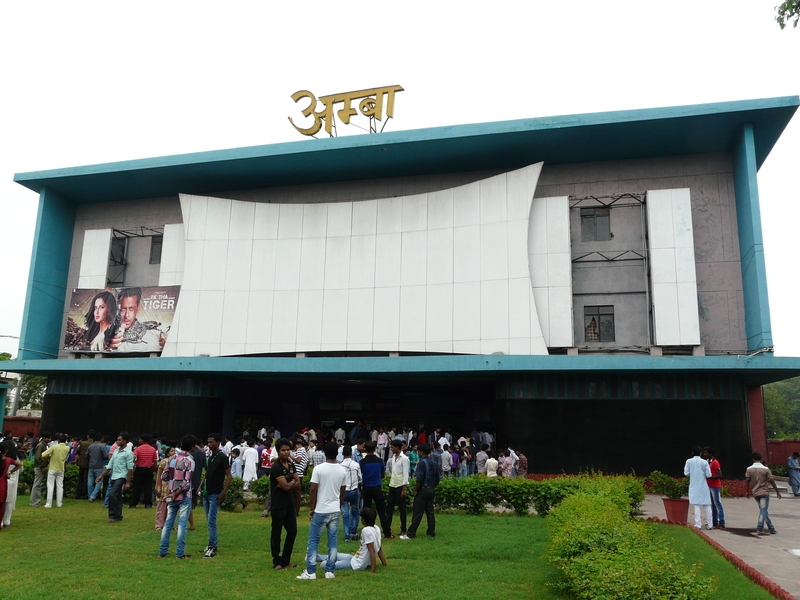 Like wise AMIR GARIB released in aug.1974 at alpna cinema was shown with full houses for four weeks continuasly. Fascinating blog. Please keep up the great work and well researched details. Memories rush back. Saw Jahanara in Jagat (1965), Sahib Biwi aur Ghulam rerun and Mere Mehboob rerun in Imperial (1964-65), Dev Anand’s Troop ki Rani Choron ka Rajah in Regal (1962), Bees Saal Baad in Golcha (1962). Raat aur Din in Golcha (1967 or 68), Piya Milan ki Aas rerun in Excelsior (1965 or 1966), Aamne Saamne in Motion (1967), Rajesh khanna’s first movie Raaz at Majestic (1966 or 67), Tumsa Nahin Dekha rerun at Jubilee (1965-66), Zindagi Aur Maut at Minerva (1965 or 66). Farz at Amba (1967), CID rerun at Natraj (can’t remember year), saw a movie each at Raaz and New Amar too but memory fails me which. 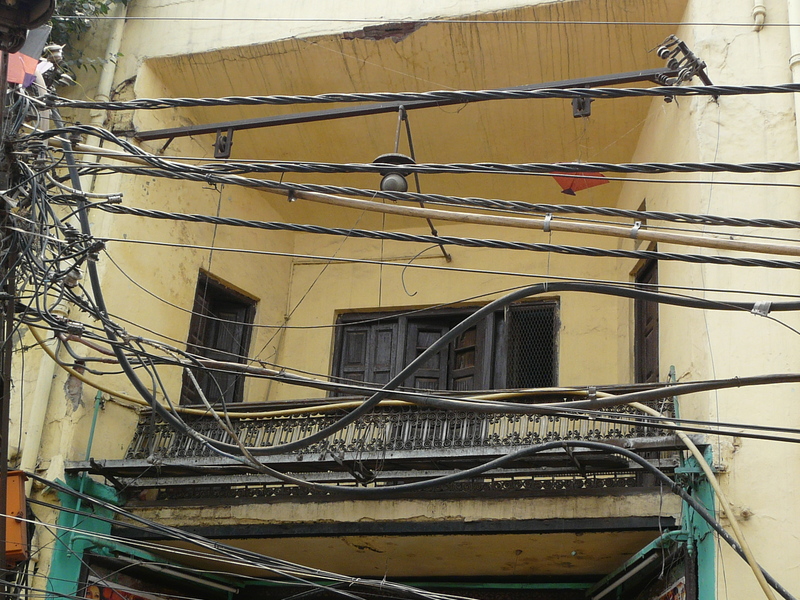 BTW, Novelty was already there when we moved to Delhi in 1962. 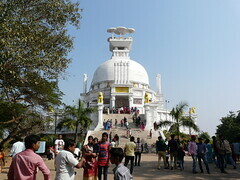 So it must have been built earlier. 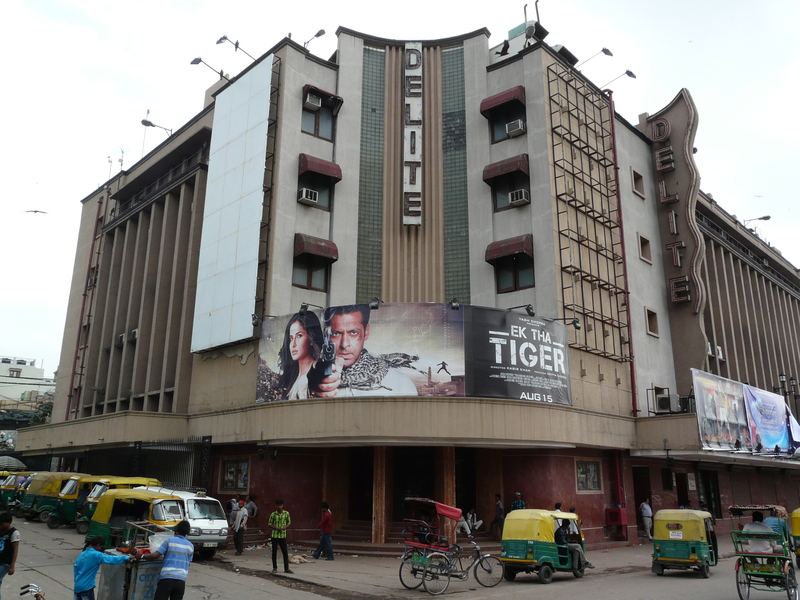 Of course, the Connaught Place halls and Sheila were our regular haunts for English movies. 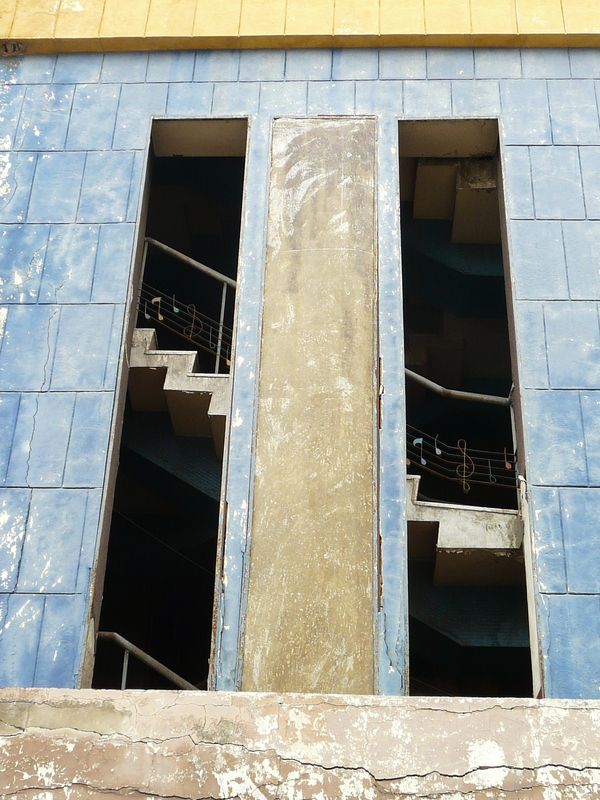 Mention must also be made of Stadium (inside the National Stadium complex where we saw Akalmand). 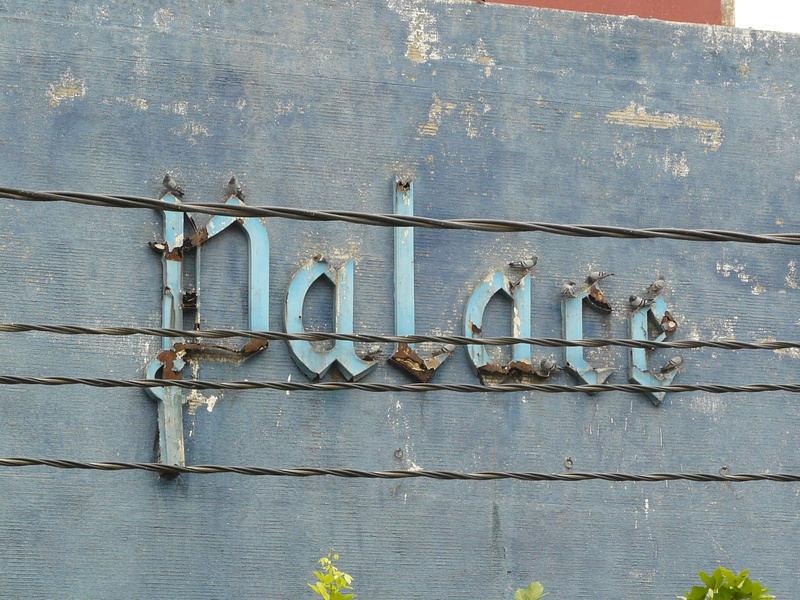 Shalimar was built in the late 50s, I know it because it belonged to a friend’s uncle. Remember seeING Nau Do Gyarah there. It was a rerun aand must have been in 1968 .